Can you have your head in the clouds. Of course you can, and you can even let your thoughts wander a little as well. It helps if you are more than 6000ft above a Greek island, and it is the largest Greek island at that, which is named Crete (Kríti) and as it is the first day of spring you are also in a happy disconnected from reality frame of mind. 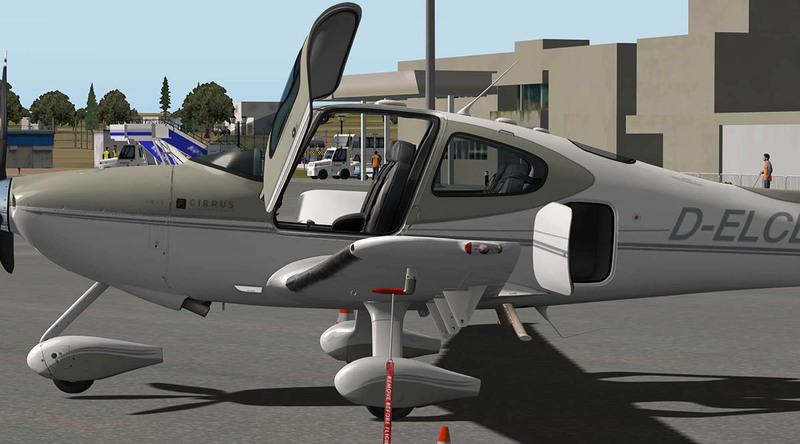 The transport is a very nice SR22 from Cirrus, and your first thought would be "hang on, haven't we been here before lately?" 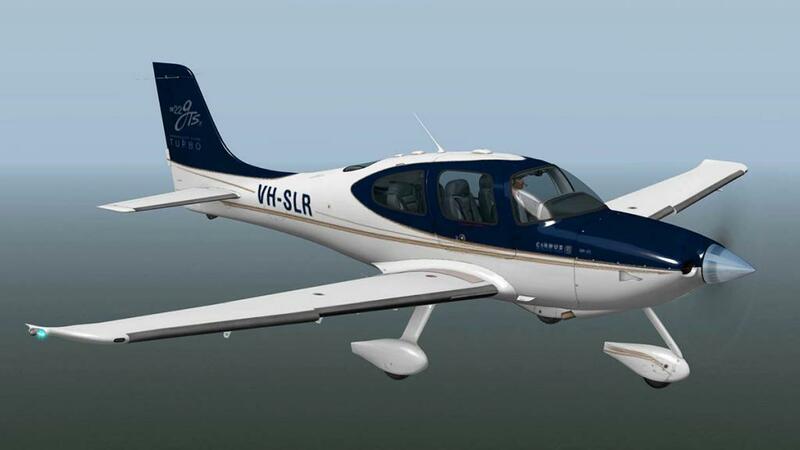 Well you have in vFlyteAir's version of the SR20 that X-PlaneReview's reviewed only six months ago. 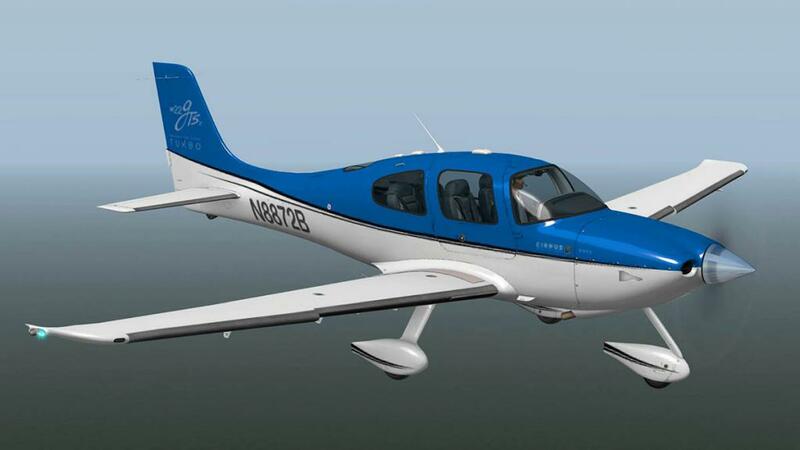 But this is the SR22 version that is a development of the SR20 and this aircraft has the larger wing, higher fuel capacity, and the more powerful Continental IO-550-N 310-horsepower (231 kW) engine. It is Turbo-Charged as well for a bit more Vroom, Vroom which is never a bad thing in a small aircraft. The flight is from LGKC on Kithira to LGIR - Heraklion which is on the central northern coast of Crete. And on how I got into this happyish frame of mind started back only a few hours ago when I first saw the SR22 back at Kithira Island National Airport. There are three menu tabs on the lower left side of the screen. 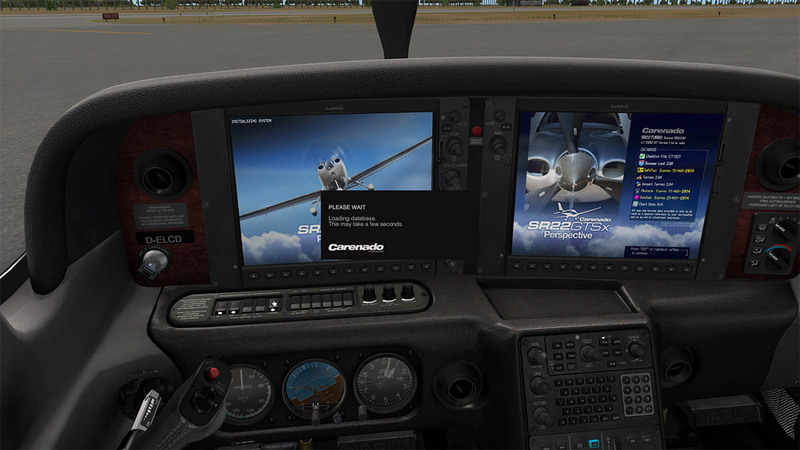 Standard Carenado in the (C) or Views/Volume menu that has the standard internal and external views plus two for switches and the G1000 screens, the volume slider is up/down on the side and point of view slider across the top. Center tab is the (O) or Options tab that covers Window and instrument reflections (always very good on a Carenado), Static elements in mostly just tags and bollards. Mouse Scroll, which is important for me with a single click mouse. 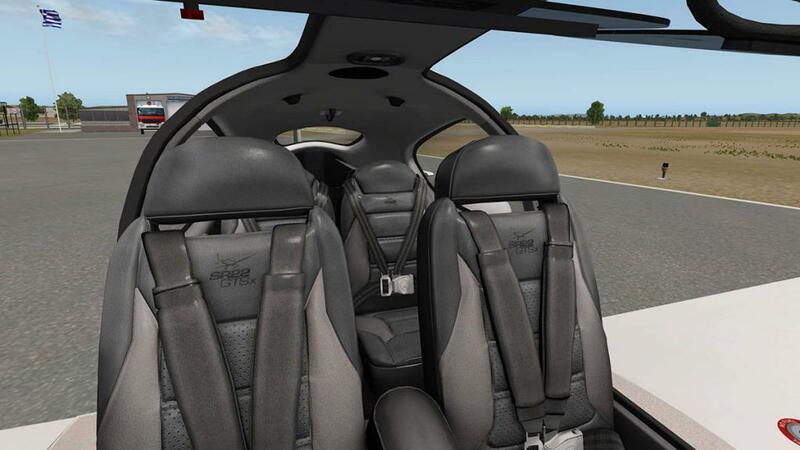 Pilot, Passenger and baggage doors, which all can be separately opened and closed, both main doors can also be opened by the latches inside. 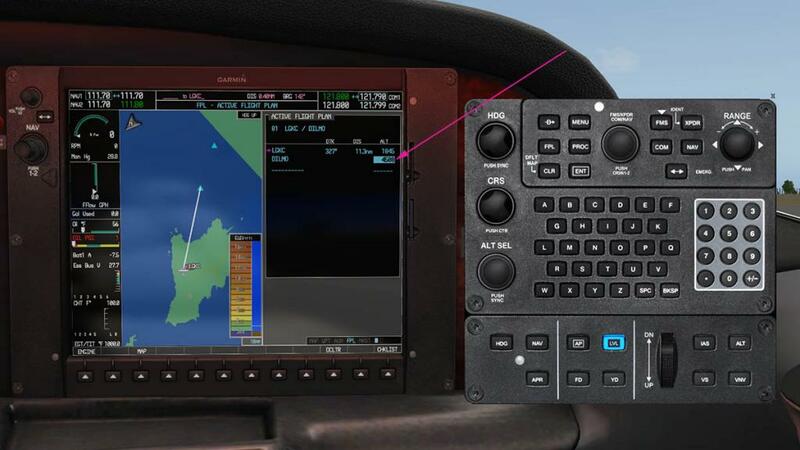 Bottom (A) tab is a big popup centre panel that covers the A/P Autopilot. 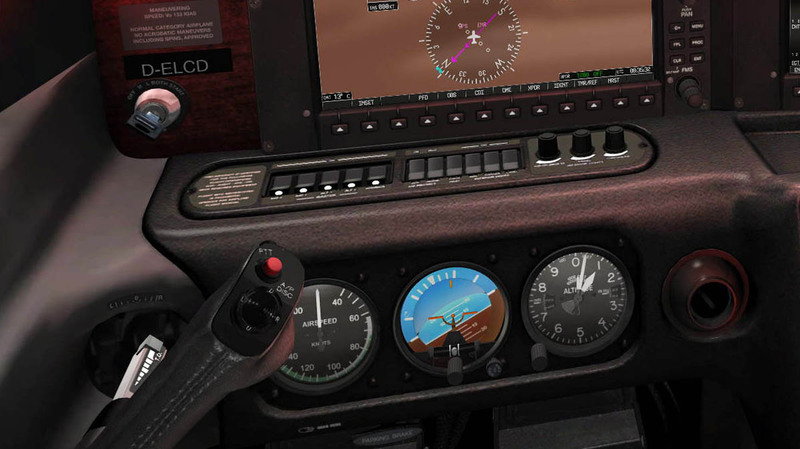 HDG (Heading), CRS (Course) and ALT SEL (Altitude Select) knobs. 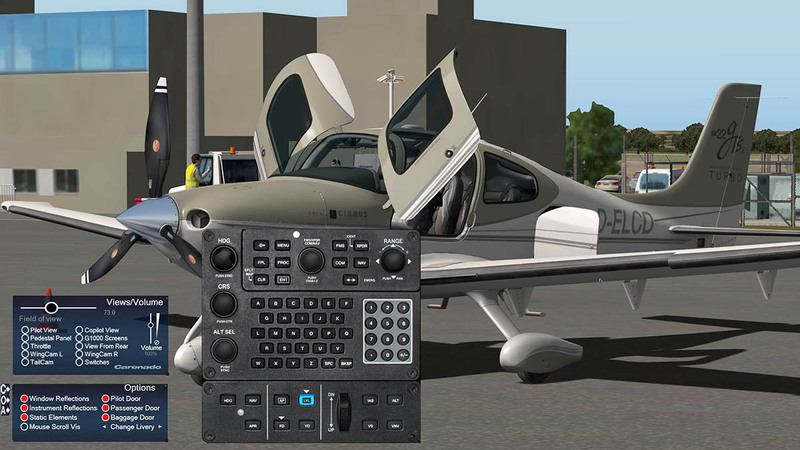 And G1000 input keyboard and control panel. The panel can be resized but is better in the full size for easy button and knob manipulation. 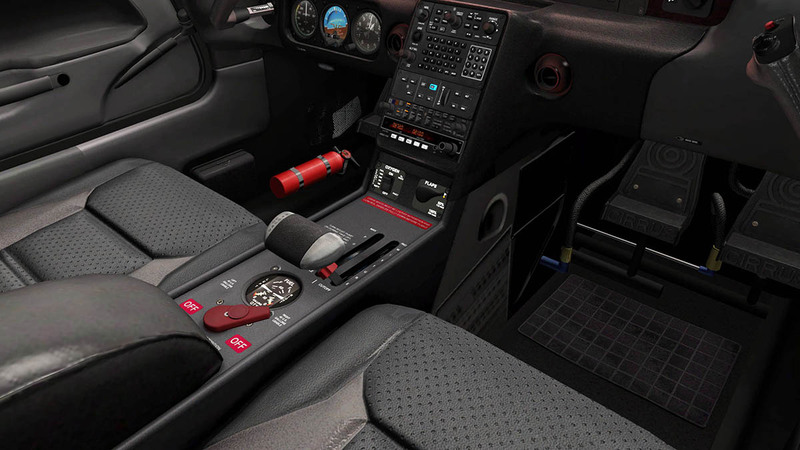 Nicely fitted out cabin is pure Carenado detailing. 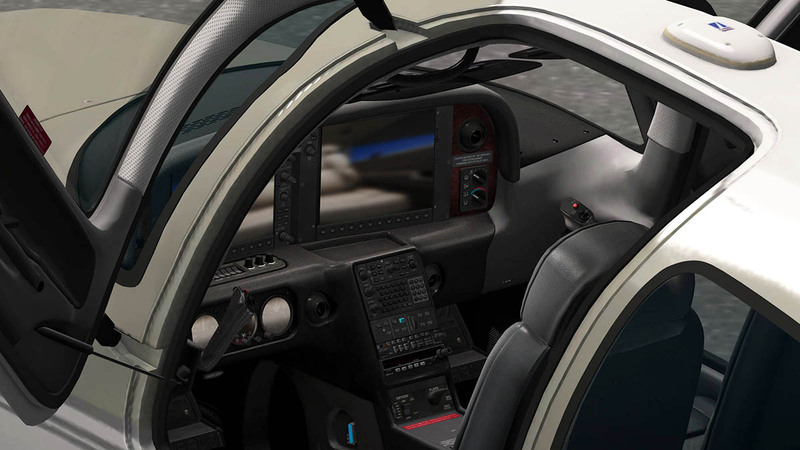 A lot darker than the vFlyteAir version, but then Carenado cockpits are always like this. 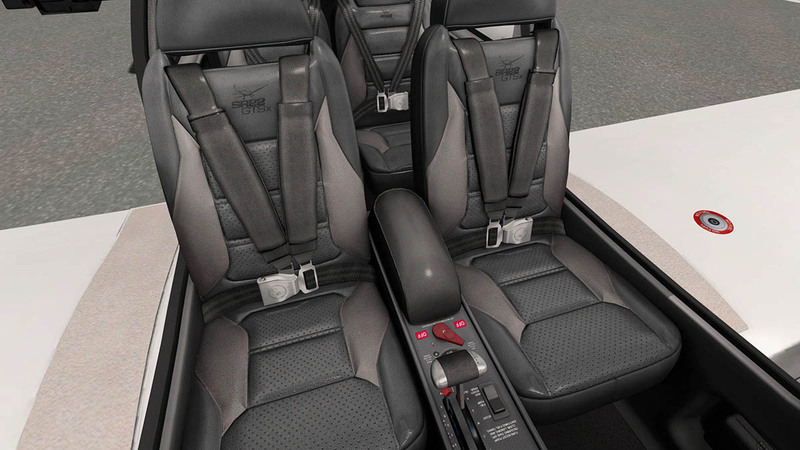 In the cabin you have four seats that are beautifully rendered and designed with great almost to the touch signature leather padded textile upholstery. Cabin fit out is bar perfect, very real and well detailed, no complaints in anywhere here. 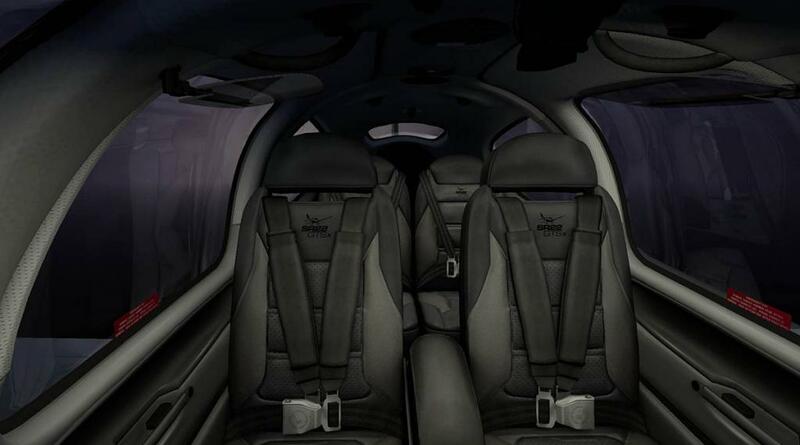 The instruments and panels are all angled and set around the flying left seat pilot. 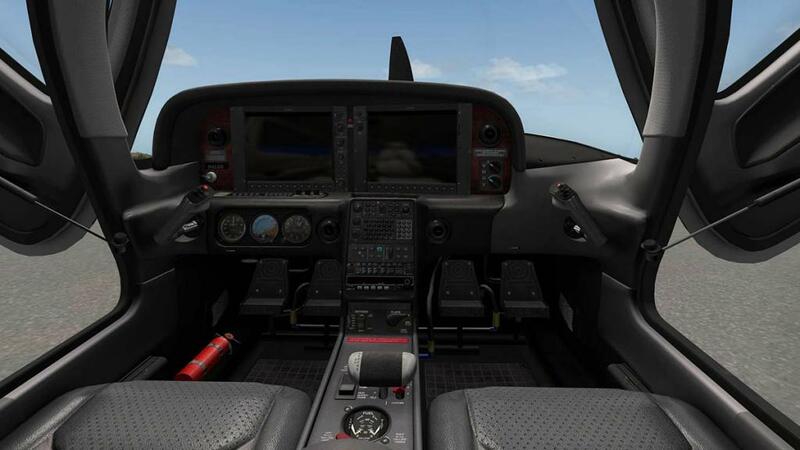 The right hand seat pilot can fly the aircraft with a yoke and rudder set, but the screen panel and switchgear would be offset to them. Overall the aircraft has minimum switchgear and controls, just the basics you require and nothing more. 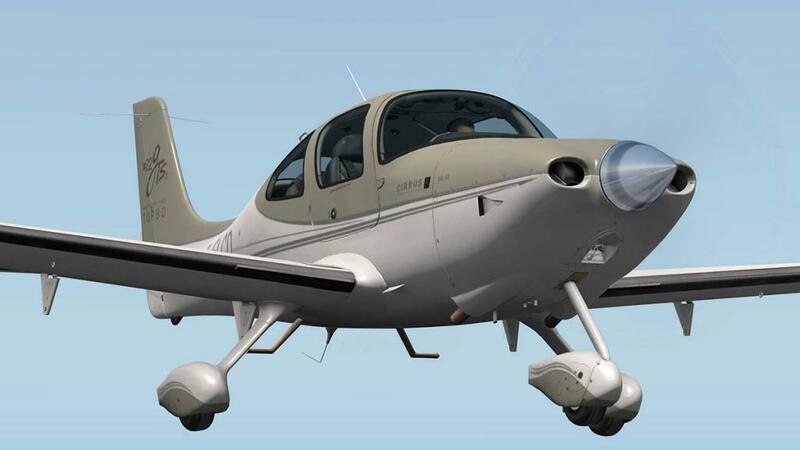 That does not mean the aircraft is not well equipped because it is, but unlike the older generations of aircraft these modern versions have been refined to a higher easier flying level. 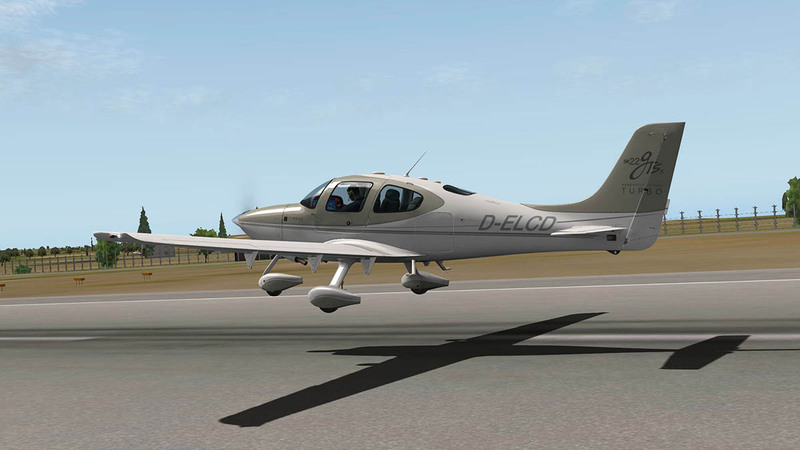 Yoke or flying handles are unique, in their push/pull and twist actions, but they also clear a lot of space in front of the pilots. Here they are both beautifully rendered. 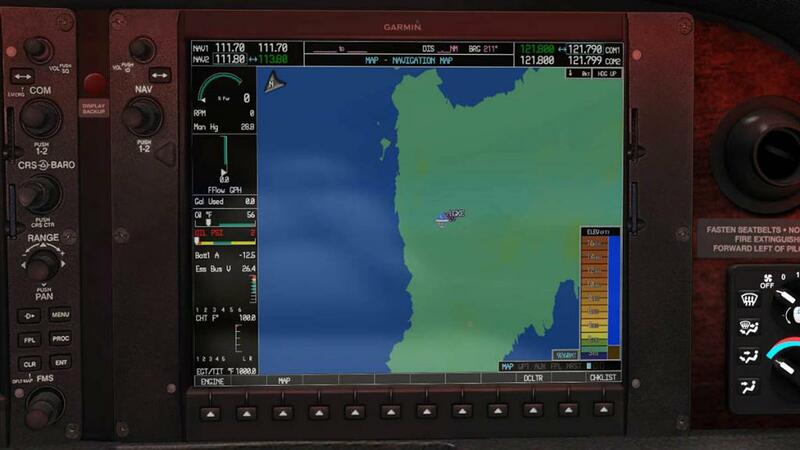 The SR22 is the second aircraft to have Carenado's unique Garmin G1000 twin-panel display system after the CT182T Skylane G1000 HD Series last year (2015). 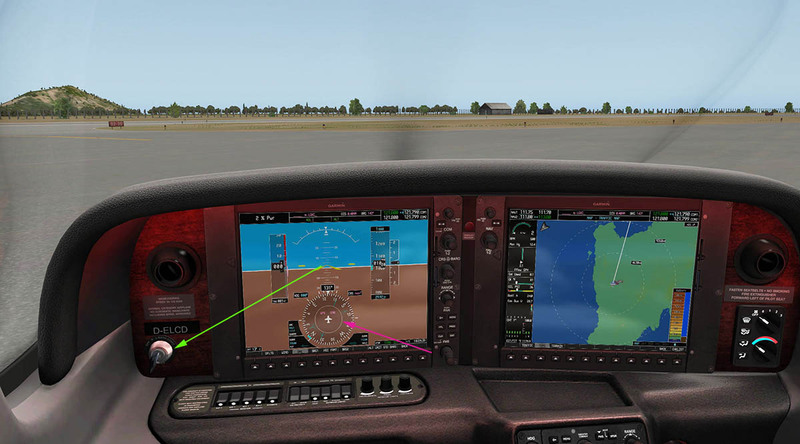 It is a totally comprehensive system that requires its own separate GPS database that has to installed in the X-Plane root folder, it is a big download at 870mb. 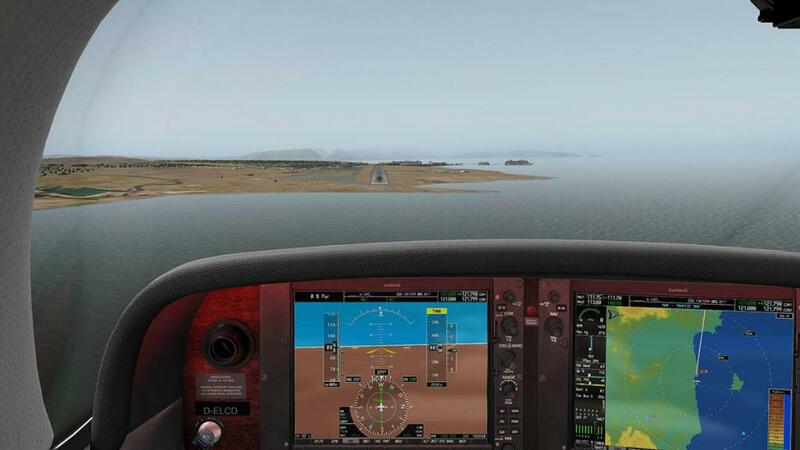 The G1000 system for X-Plane has been in development at Carenado for some time and it is almost a fully working direct copy of the real world G1000 system. When you turn on the aircraft's (battery power), you have to wait (a fairly long time) while the database loads into the system. Power is supplied by the first two rocker switches in BAT 1 & 2 on the switch panel located on the shelf under the left hand panel, next two switches are the ALT 1 & 2 (alternator) switches but the last rocker switch to the right of the set is the "Avionics" switch to start up the right hand G1000 screen. 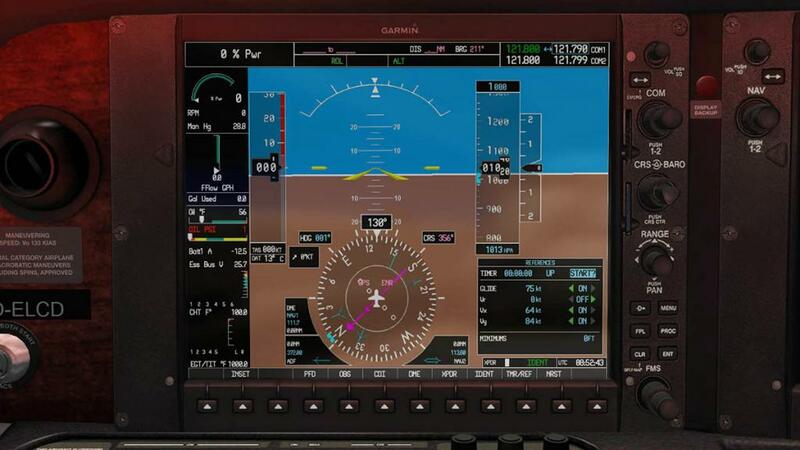 When the avionics are switched on you still have to activate the screen by pressing the ENT (Enter) button on the middle console panel or the menu button far right on the display. 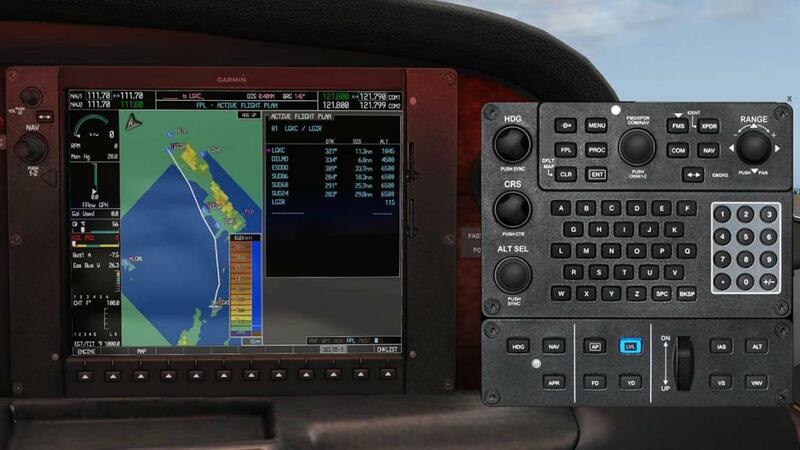 Before we go into the complexities of the G1000 system, let us look at the instrumentation and the rest of the switchgear. 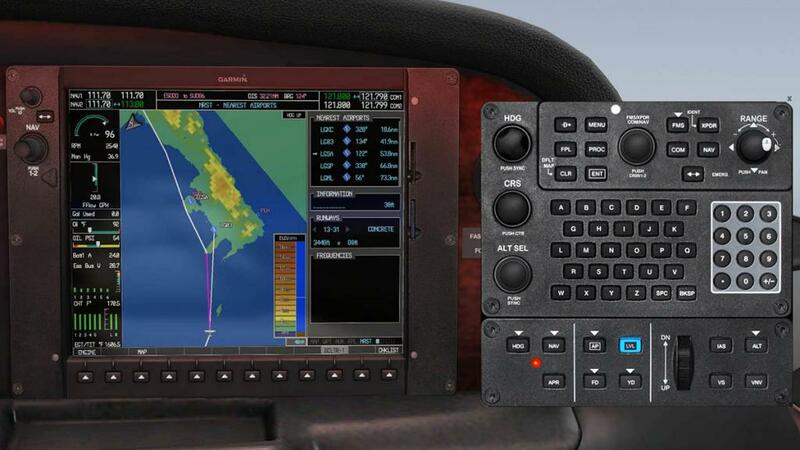 The rest of the main switchgear panel covers the Ice Protection On-Off, MAX or NOR Ice setting, Pitot Heat, Exterior lighting (Nav - Strobe - Land). Three knobs on the far right adjust the panel and interior lighting. First knob adjusts the instrument lighting, then the red cowl lighting and the last right knob covers the overhead spotlights. The red cowl lighting is quite vivid at the full setting, I tuned it down to be more somber in tone, but it looks very good against the fake wood grain paneling. 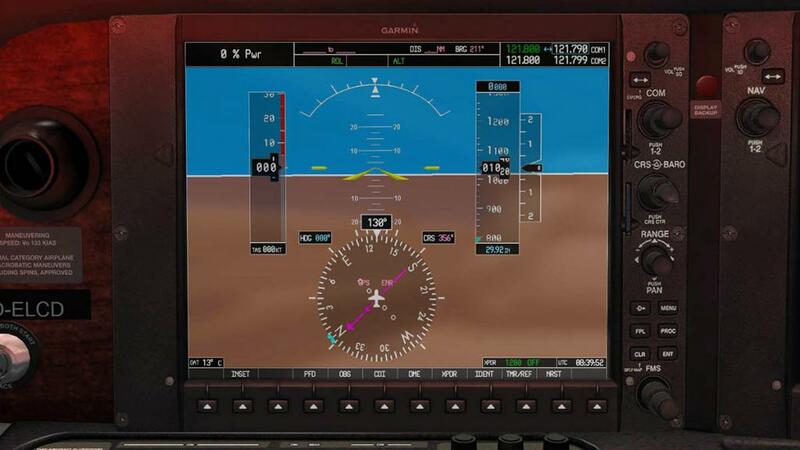 Directly in front of the pilot are three lower standby dial instruments in "Airspeed", "Artificial Horizon" and "Altitude". All backup dials are very clear and well presented. On the centre console at the top is dominated by the huge A/P Autopilot and G1000 input keyboard and control panel, that we mentioned earlier and as noted then it pops up via the menu for ease of use. 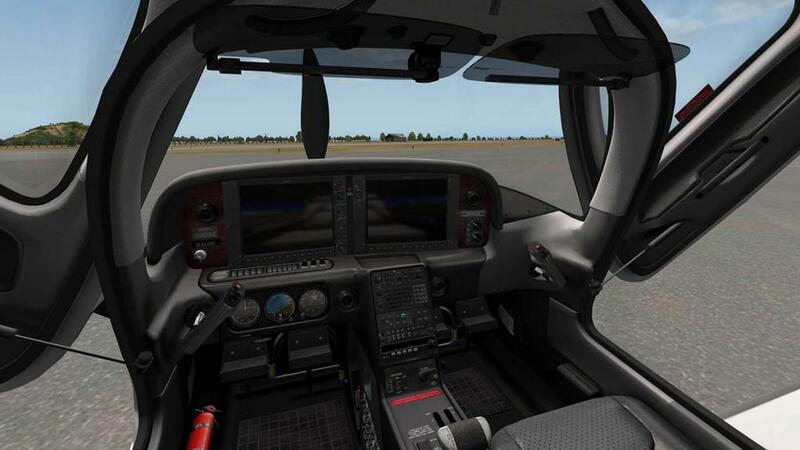 Then a standard Garmin GMA 350 radio set and lower an ADF Bendix King KR87 TSO direction set. Lower centre panel is the Oxygen selection and Flap selection in "up", "50%" with a 119kias restriction and "100%" flap with a 104kias restriction. Nice big throttle lever dominates the lower console in look and feel. 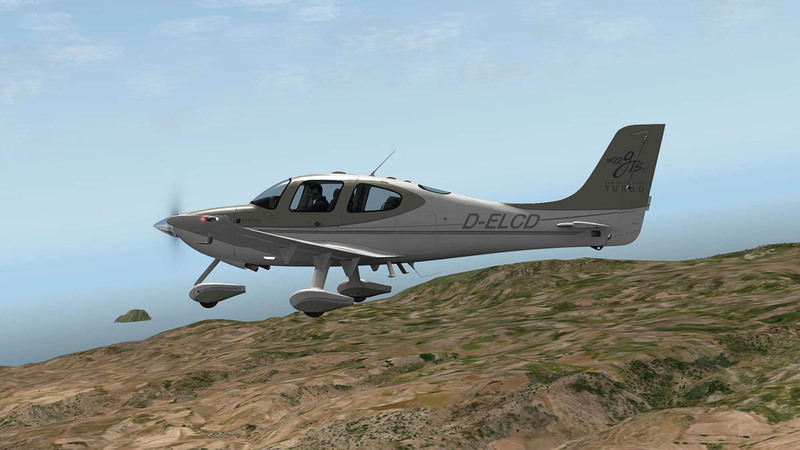 This "Single Lever Throttle Control” automatically adjusts the propeller speed through the use of the throttle lever. 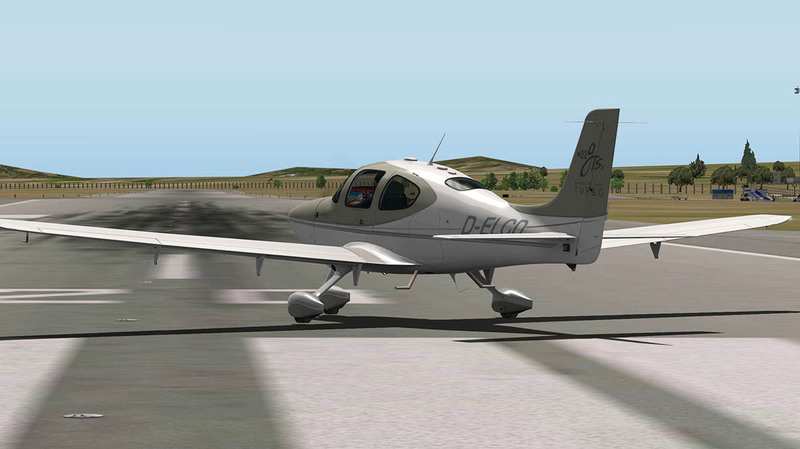 There is no separately-controlled propeller lever on the aircraft. To the right is the red knob "Mixture" lever with "Rich" to "Lean" adjustment. 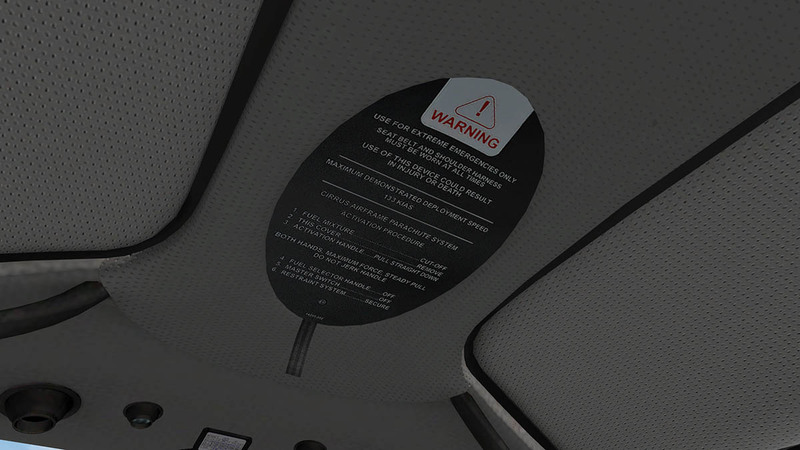 You can switch to each fuel tank via the switch, but have to press the red "OFF" panels to turn it off. Very nice tank gauges are set out above and are very clear for use. 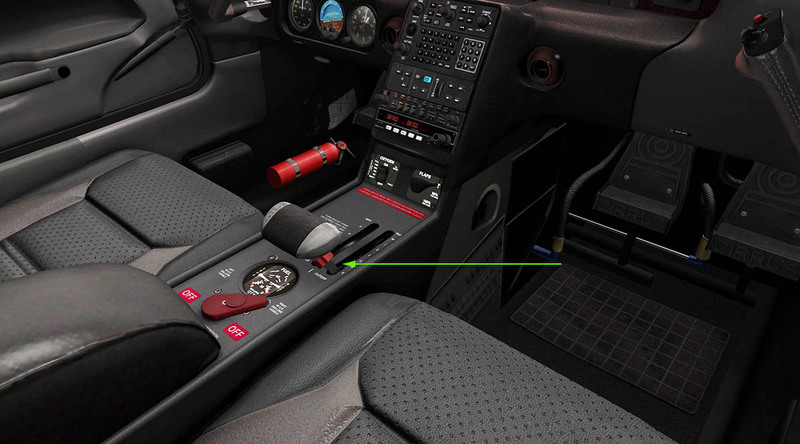 Sets of fuse breakers are on the left inside of the centre console. Very right of the main panel is an environment control panel for fresh air and heating turn switches. Garmin twin panel G1000 gps sets are now becoming common in X-Plane. These systems are menu driven, which means you select the different functions you require via the lower row of buttons and the changing menu selections to show the items you need. 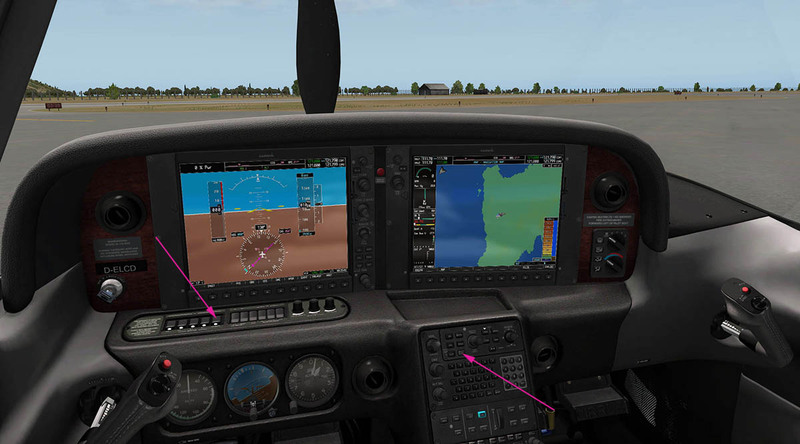 Yes they are very good these G1000 sets but you can get lost in the various menu trees to find sometimes something very simple as say the VOR2 pointer. There are some real world layouts of the various menu trees and the Carenado manual does give you an excellent overview of the complexities of the system, but it does need some study to not find yourself spending a lot of time going through all the many various combinations of menu selections to get to the function of what you want. 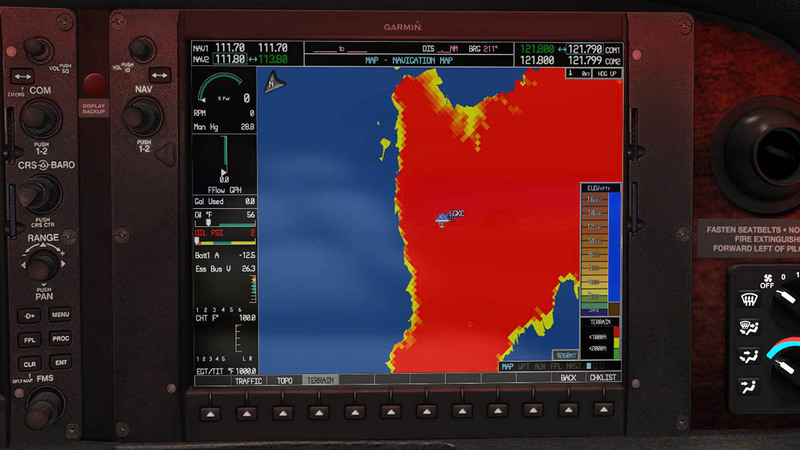 There are many on screen options and featured here in the lower displays around the heading rose is your NAV1, ADF and right VOR2 pointers. 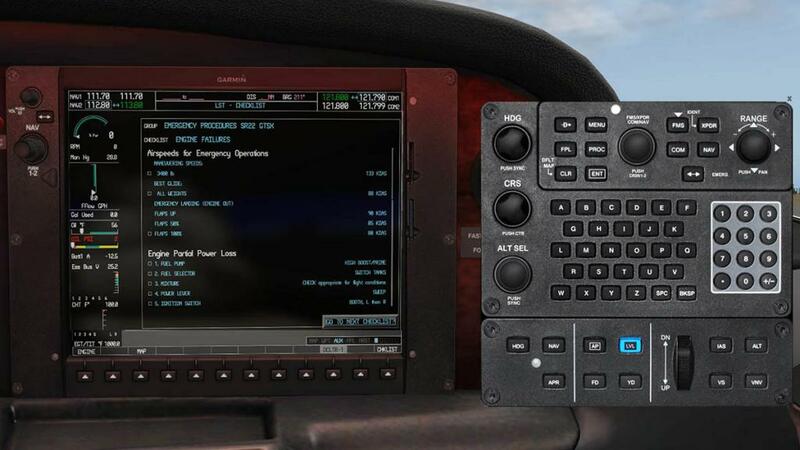 You can fill up your PFD panel with a lot of information. 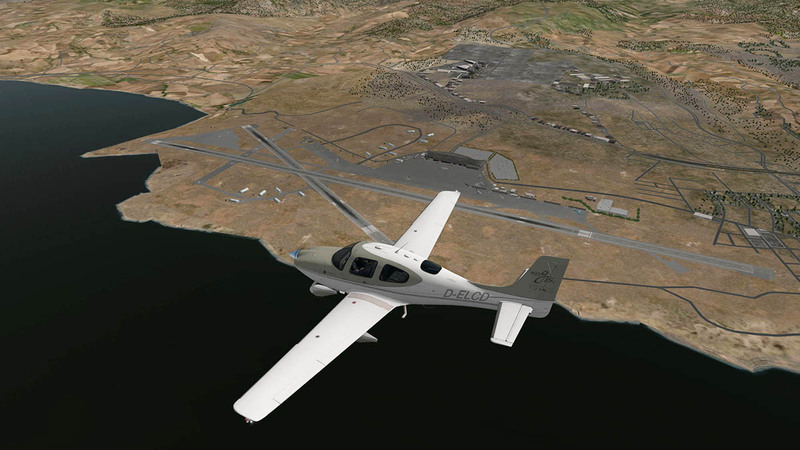 Including NEAREST Airports, A small view of the MAP, References and an engine monitoring side panel. But all this takes away the main objective of these huge displays to deliver clear simple information of flying the aircraft. The objectivity is the use of the huge artificial horizon that covers the whole display. It has built in Pitch, Rate of Roll (very nice with built in indicators called "Trend Vectors"), speed and altitude tapes (built in Vertical Speed - or +) and lower Heading, noted Lower rose heading dial has built in CRS (course) and The Course selector is also your Nav 1, Nav 2 and GPS (autopilot) selection modes and built in CDI (course deviation indicator) for runway ILS alignment. 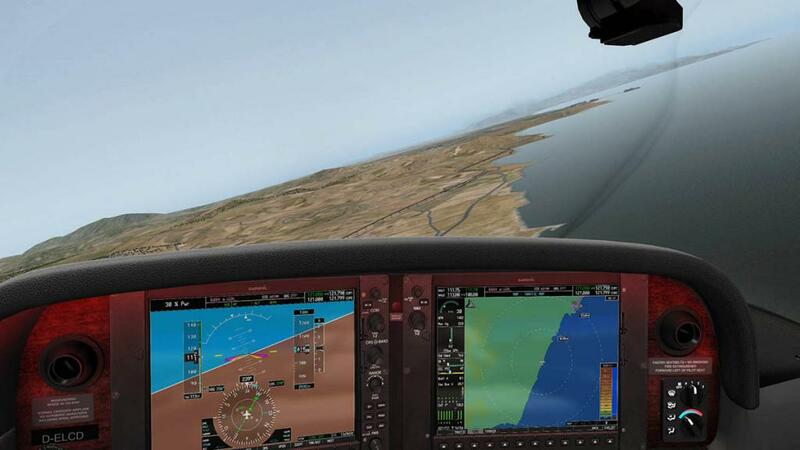 Top of the PFD is an information grid that covers "Engine Power%", Autopilot status, Prev and Current waypoints when the flightplan is active, Distance to the next waypoint, Est time to next waypoint, COMM 1&2 Frequencies. displayed also in the top lower grid is your active GPS/NAV1/NAV2, AP (autopilot), ALT and VS (Vertical Speed) status, Altimeter and VVI and bottom are Baro and OAT temp. 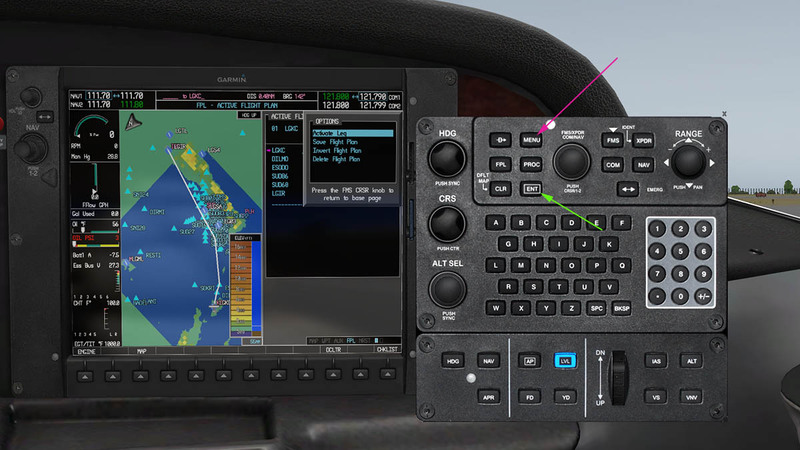 If you are familiar with the default X-Plane GNS 430/530 GPS system then the knobs and buttons down the right of the display will be a no brainer. Comm 1&2 selector, CRS/Baro adjustment, Map range, (buttons) Direct-to, FPL (flightplan), Clear and Enter (ENT). PFD/FMS inner/outer is at the bottom. 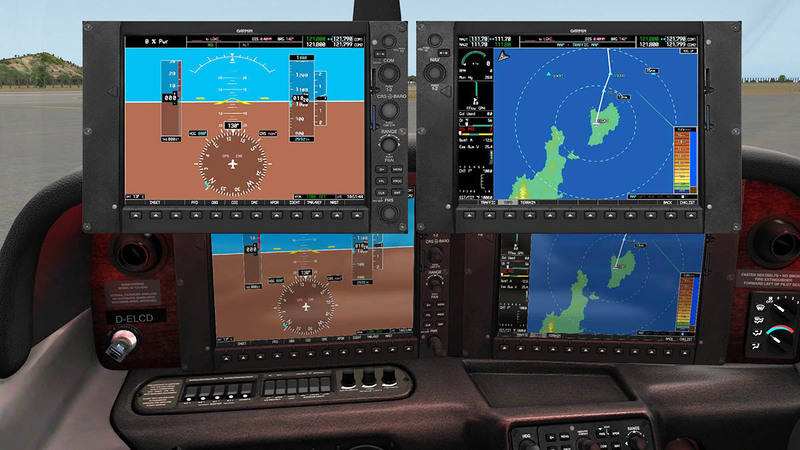 The right hand MFD (Multi-Function Display) display is the more flexible screen that covers a lot more variations and different areas of the aircraft's position and condition. Note that both screens can be swapped around if required for use. There are two main modes for display on the MFD, in MAP (Navigation) and ENG (Engine) modes. We will cover the ENG mode first. Note first the engine here is not running. Engine parameters covered are "Engine Power%", "Engine RPM", "Man In HG" (Manifold Pressure), "FFlow" (Fuel Flow), "Oil" Pressure and Temp. 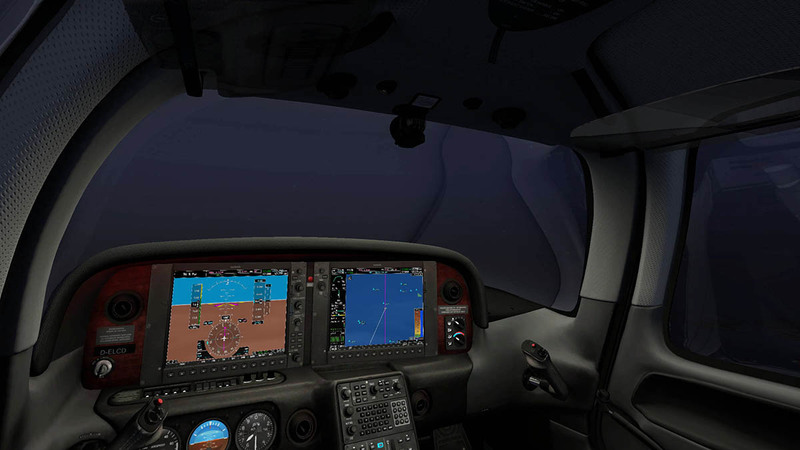 "Engine Temperatures" are covered in CHT ºF and EGT ºF. Anti-Ice Amount (in GAL) and Oxygen Pressure. Electrical output section covers both Current (A) and Bus Volts (V). The Fuel section displays "Fuel Qty" (in GAL) for both tanks, and fuel calculation data in "Used" - "Rem" (remaining), "Time Rem" and "Range" on the remaining amount of fuel in both tanks. 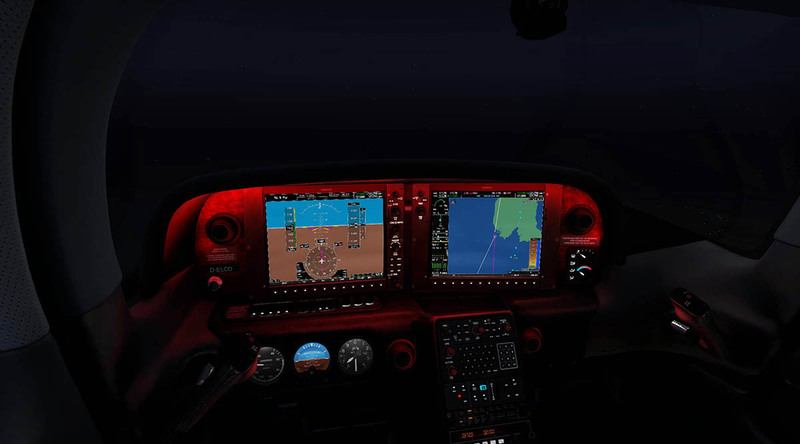 I found the fuel data really helpful in planning and in flight on managing your range and fuel tank selection. Air data in altitude and OAT (outside Air Temp). 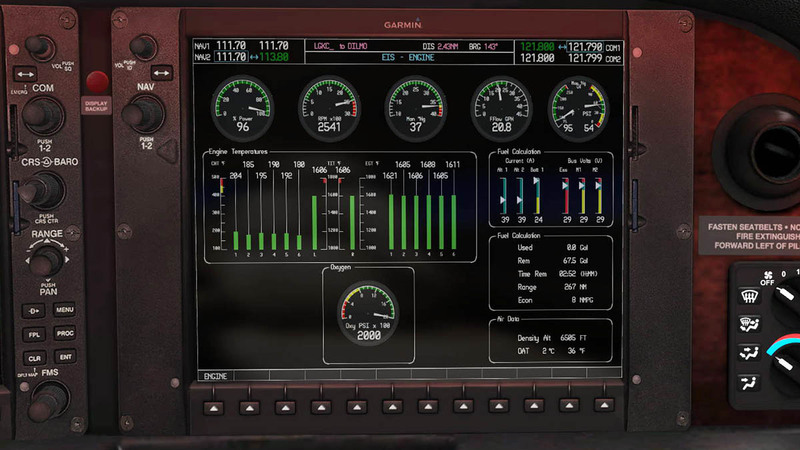 Switch to MAP mode and the engine status parameters are located on a side panel that covers the RPM, FFlow, GAL used (fuel), Oil Pressure and Temp, Current (A) and Bus Volts (V), CHT ºF and EGT/ITT ºF. 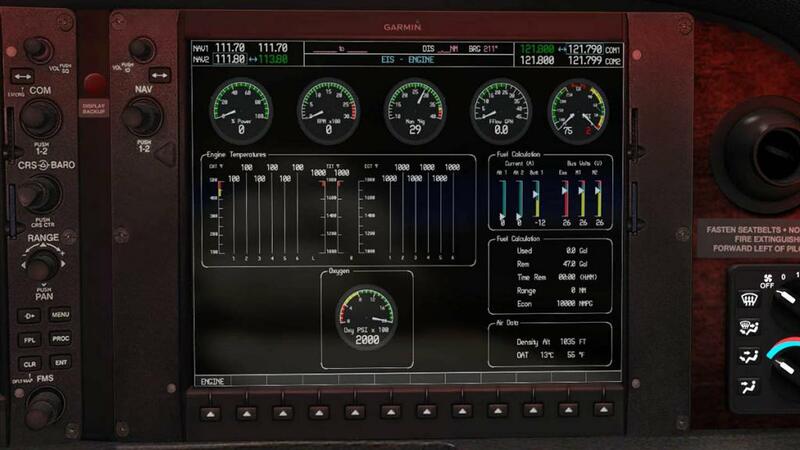 This engine status panel is the one that can also be visual in the PFD. 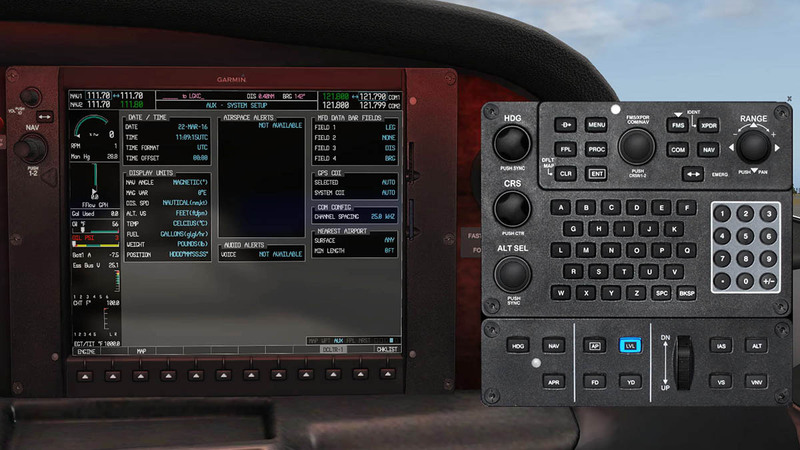 At the top of the MFD is a duplicated grid of information that is situated across the top of the PFD except the PWR % is missing and is replaced by the NAV 1&2 Frequencies with adjoining adjustment knobs and slider button. Biggest feature of the G1000 is the huge GPS map and terrain options, One thing to keep in mind is that to show a screen of terrain data at this size requires a lot of processing, and a huge task of your computer processing needs. 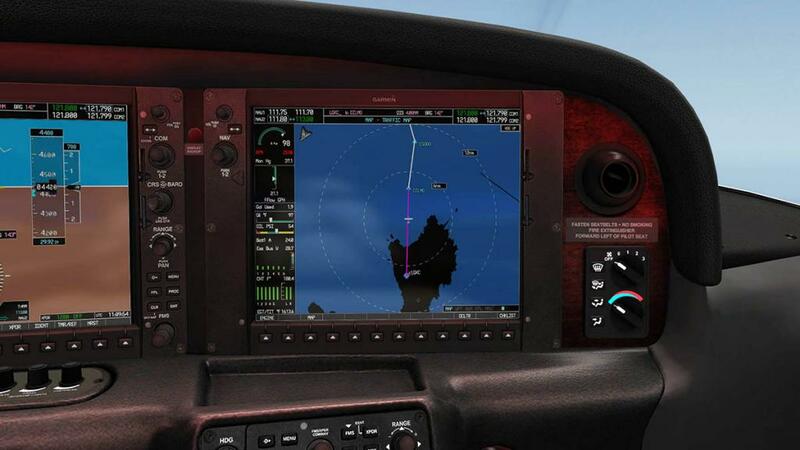 This can make the screen sometime quite slow in responding and mostly if the screen (or the aircraft) is turning to a new heading or redrawing the images on the display. 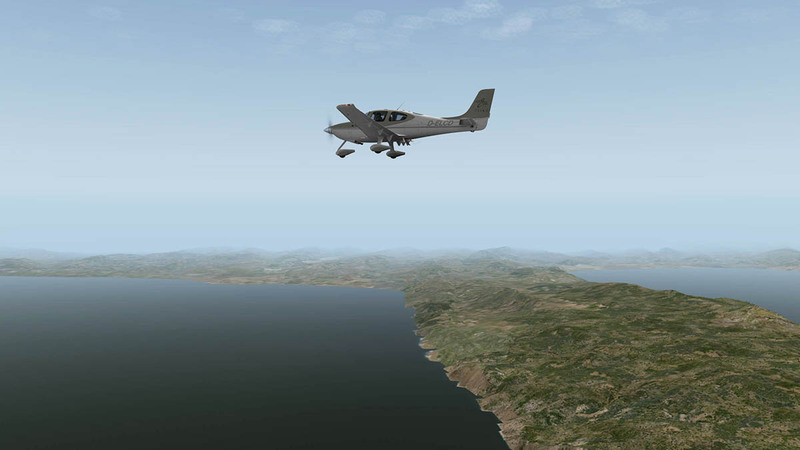 Terrain options include, Traffic - Topo (topographic) - Terrain - Airways. You have a built elevation guide to evaluate the current terrain. 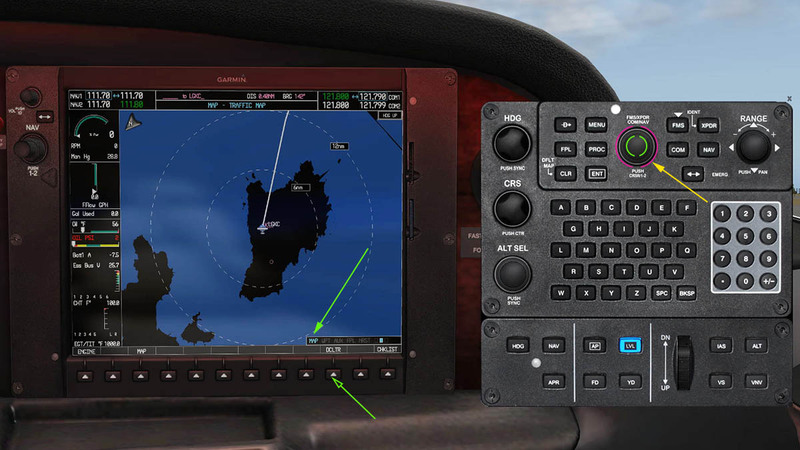 Creating and using flightplans are accessed by the FPL button (Green Arrow) on the G1000 Control Unit panel. 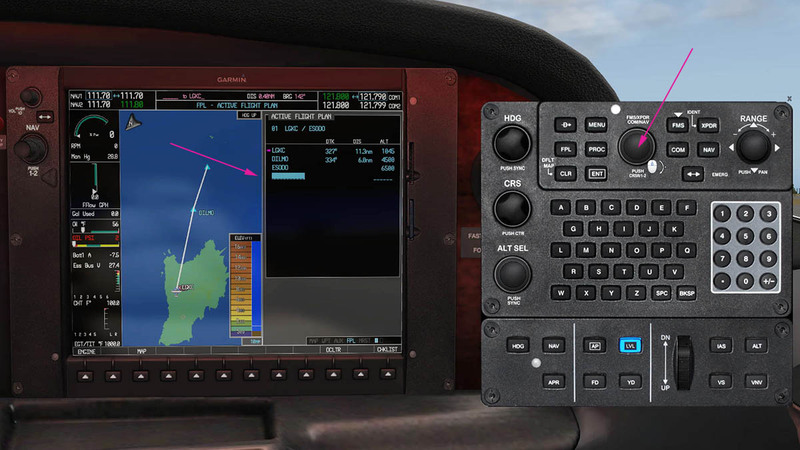 This button brings up flightplan panel on the MFD display, and here you can create, save, adjust, reload and delete flightplans. 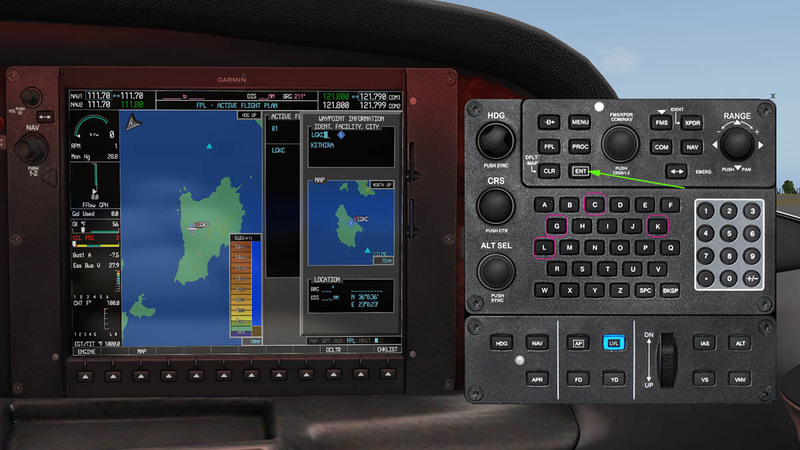 To start to create a new flightplan then use "FMS Knob" in the centre of the top part of the main programming control panel. This will give you the standard half-moon manipulators in large and small and also note your current GPS position on the display. 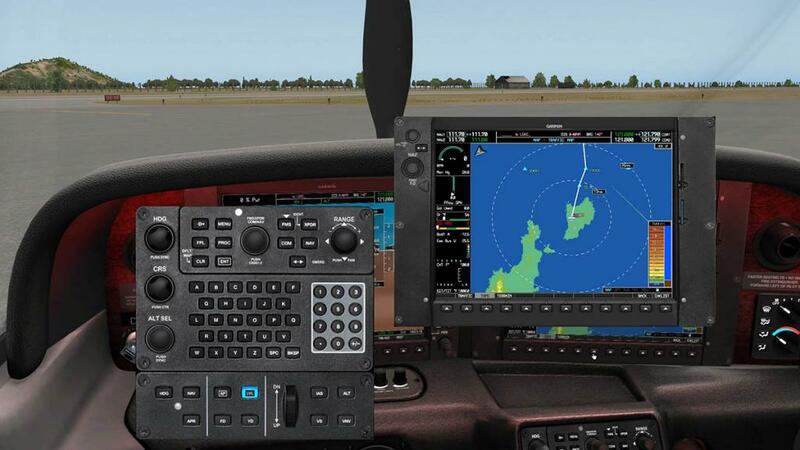 The large manipulators are used to move down or up a line of your flightplan (segments), the same as your standard GNS GPS. 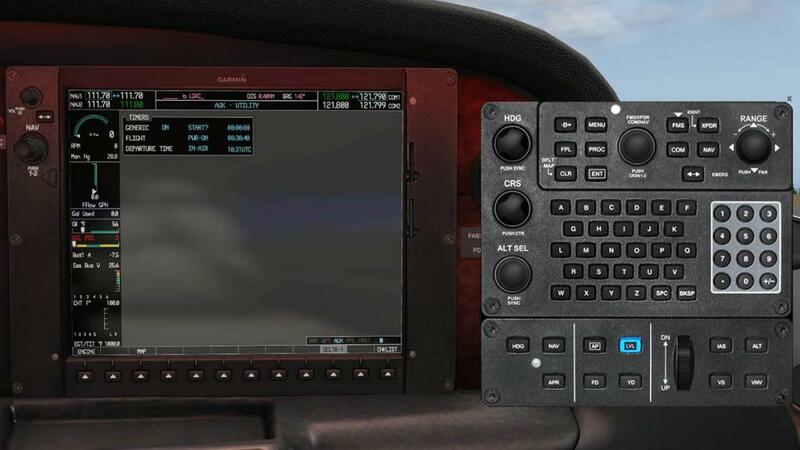 The smaller higher manipulators will open another window to insert the Nav-Aid/Fix and these inputs are done via the alphabet/numeric keyboard. Note I found the console manipulators really hard to use (mostly the small right half-moons, Carenado note it is the angle you use the manipulators, but it is still too hard) but the manipulators used on the popup panel with the menu tab was fine, and the inputs on mostly the first letter of a waypoint/fix was also very slow and or had to be backtracked and done a second time to insert, the rest of the digits were not so bad. 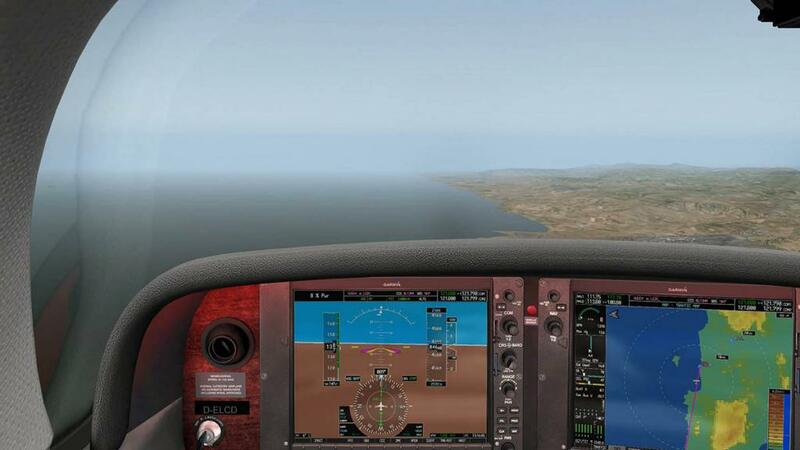 When the GPS Nav-Aid/Fix is done then press ENT to insert the waypoint in the flightplan. Again select the second waypoint by using the inner manipulators to bring up the insert window and inserting in waypoint code. 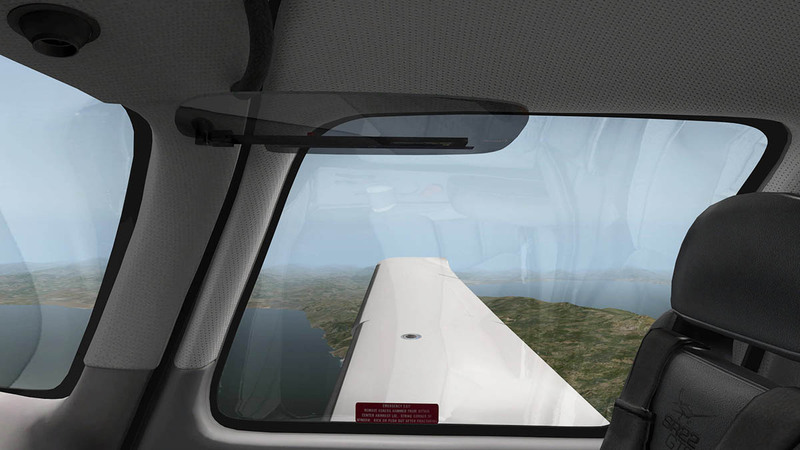 When entered you will note the first departure point of the flightplan the altitude for the airport is automatically inserted. 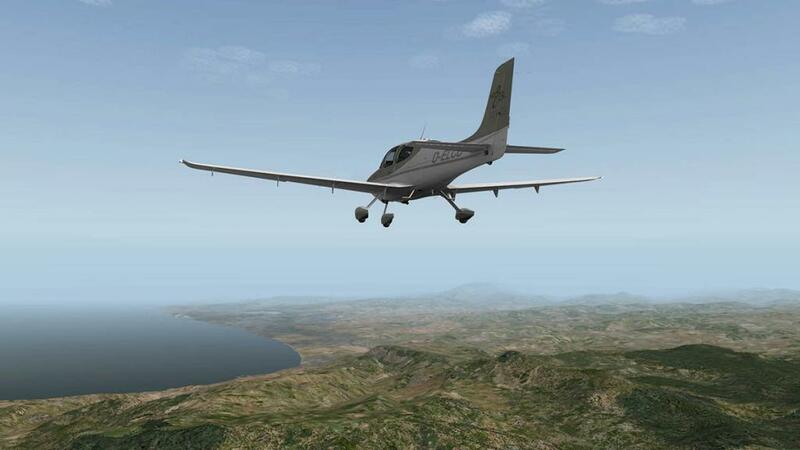 On the second waypoint line you have to insert the altitude you want to use when you arrive at the waypoint. This is inserted in the right hand selected (larger manipulators) box. 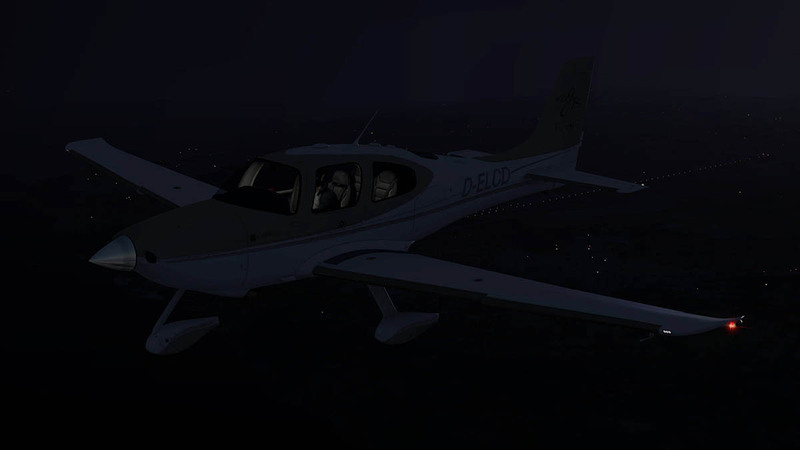 Then again ENT to save the waypoint into the flightplan. 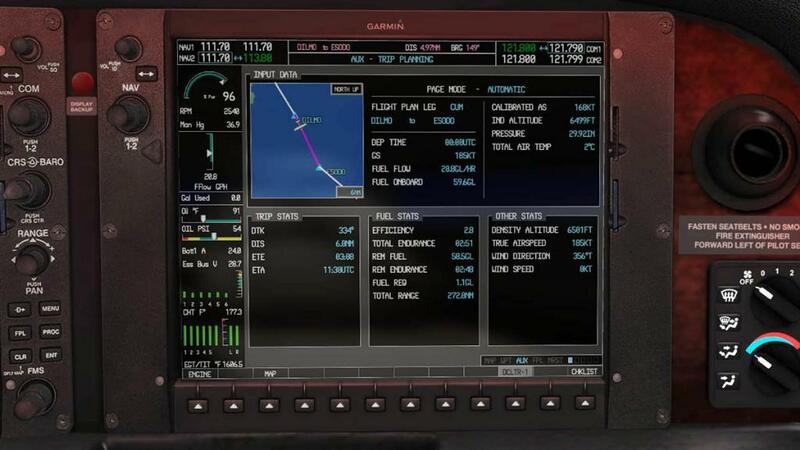 You repeat the process until you have the full route from Departure to Arrival airports completed then you activate the first waypoint of the flightplan (departure airport) by using the MENU (Options) button and selecting "Activate Leg" and pressing ENT to load the flightplan into the system. You can SAVE your flightplan here also, INVERT it (or swap the whole flightplan backwards to start at the current arrival airport) or DELETE the flightplan from the full list which is shown in a separate page window. 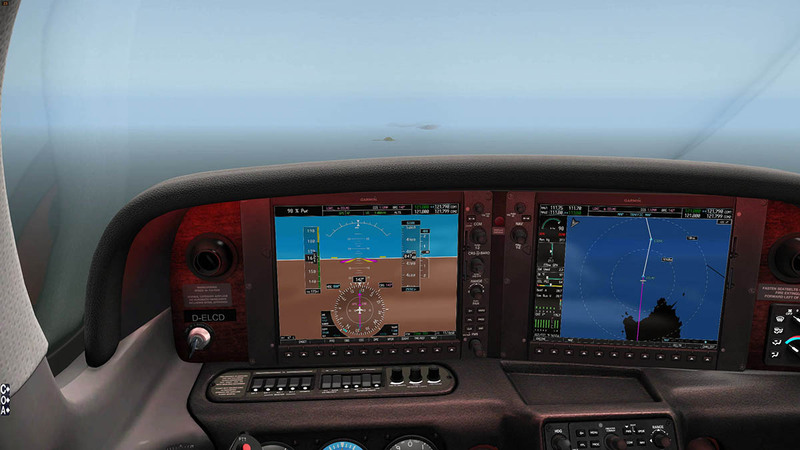 Basically the G1000 system is still like the standard X-Plane GPS GNS430/530 system, just slightly different on the way you access it. You can zoom in or change the range of the flightplan in MAP mode via the large knob on the right (RANGE). DCLTR will "declutter" the map in three positions. 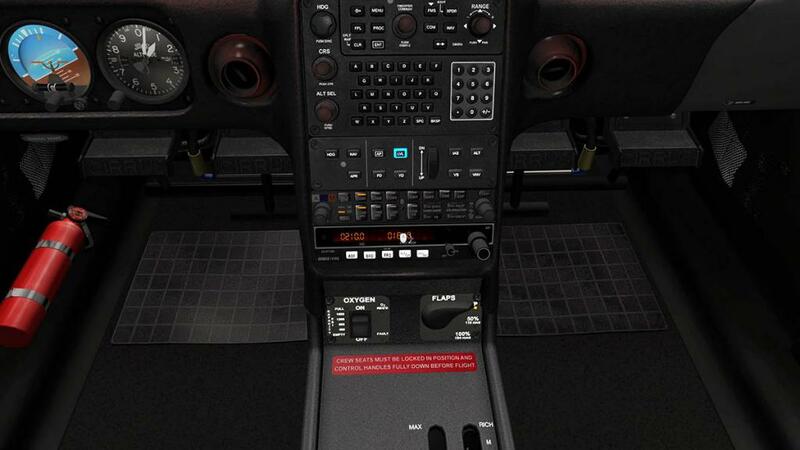 Also like the X-Plane GPS GNS430/530 system, you have a menu system along the lower right part of the MFD. Changed by the manipulators (High/Low) it gives you access to a lot more information. 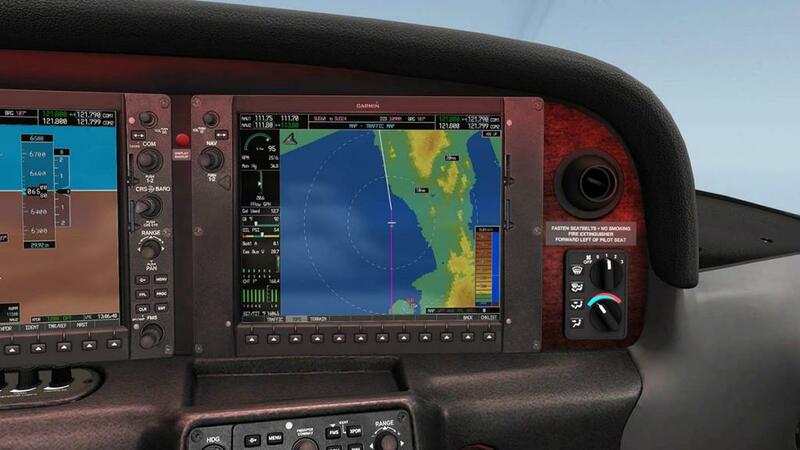 Most are a replica of the standard Garmin system in MAP, WPT (Waypoint), AUX, FPL, NRST. The different one here is the AUX (Auxiliary). ... SYSTEM STATUS and CHECKLISTS (Standard and Emergency). A lot of the data shown above is not full realised because the aircraft is stationary and not running, so we will revisit a few moments when in flight to see how they perform in action. Menu panels and G1000 displays all pop-out for ease of use and can be moved around your screen for the best position to access. Pop-outs are just as clear and the same resolution as the fitted panels and that is sometimes very rare. 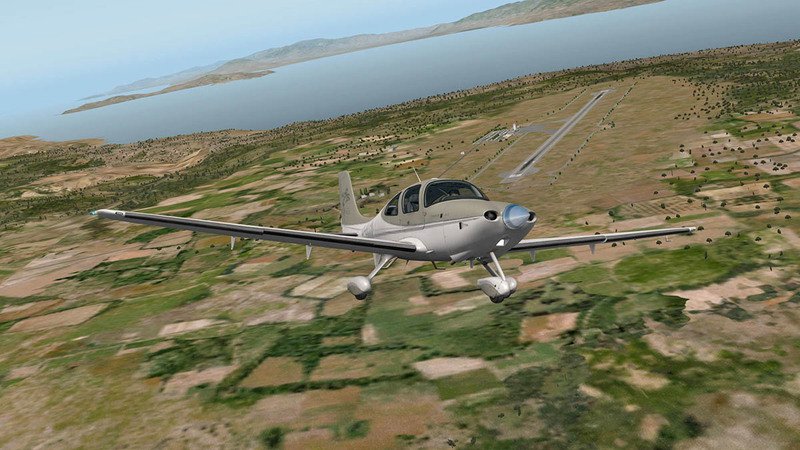 I tanked up the CIRRUS to give me 5.0hr of flying. You need to select a tank with the pointer selector on the centre console. The "Mixture" lever is moved to "Rich" but it is hard to get at as it is hidden by that large throttle handle, from the Pilot's position you can't move the mixture unless you move the throttle itself, or move your view right over to the passengers right hand seat. You can close the doors from the inside via the latches, and they close with a nice "thunk". Adjusting the panel lighting and you are ready to start that Continental IO-550-N 310. Pump boost on and a turn of the key allows the engine to turn, churn then roar into life. Sounds are as per usual Carenado's in very good if not excellent here. 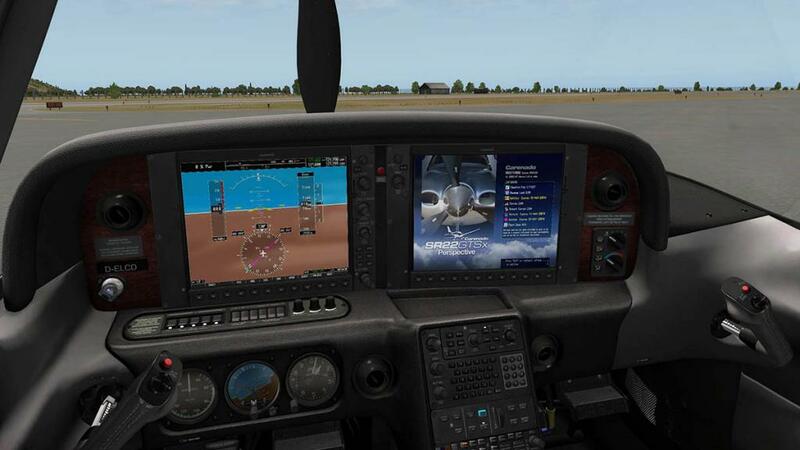 Set the CDI to "GPS" and that it is now ready and waiting for the flightplan locked in once you are airborne. 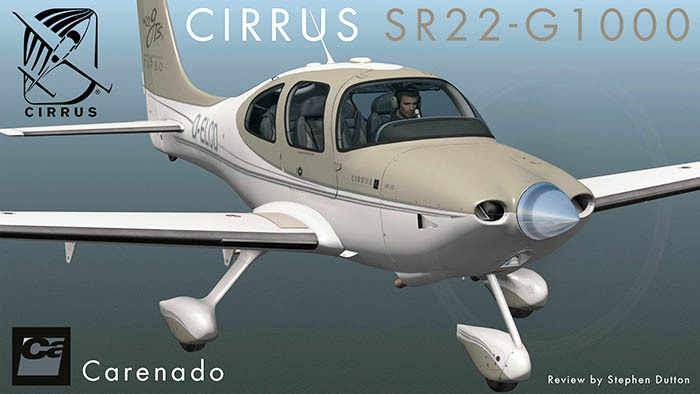 The SR22 has the new Carenado feature that allows castoring of the front steering. I found it a bit too twitchy for my liking, and you need a bit of momentum before it will actual release from the straight ahead position. 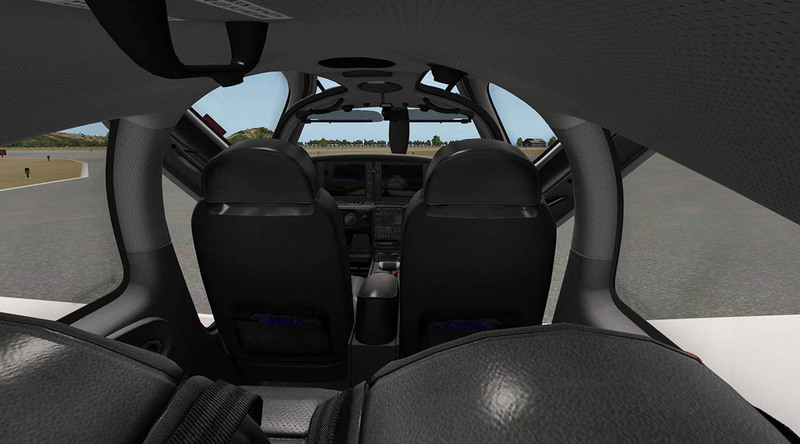 A lot of Carenado steering is like this and you get used to it, but the slightly higher speed required here to get the steering working smoothly can have you putting on too much speed initially to bring it quickly down again to find your taxi line with it then suddenly locking up again. Once you do get the right momentum and speed it is fine but a bit more usability would be nice. 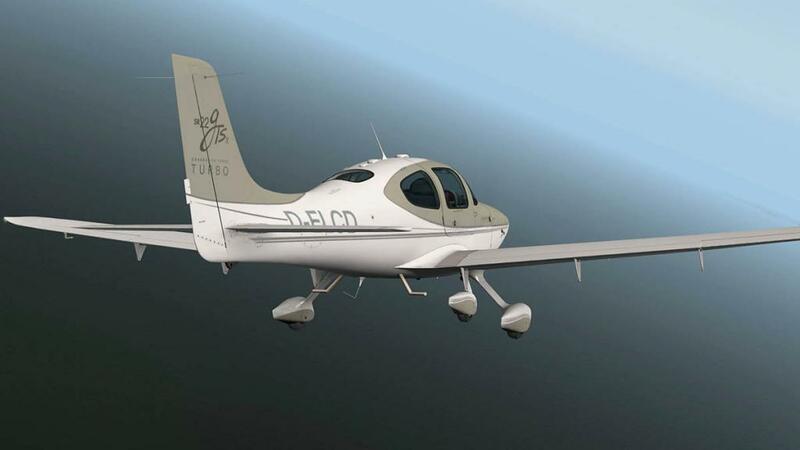 The Cirrus will track the centre line quite nicely without too much rudder adjustment and you can rotate up at around 100knts. 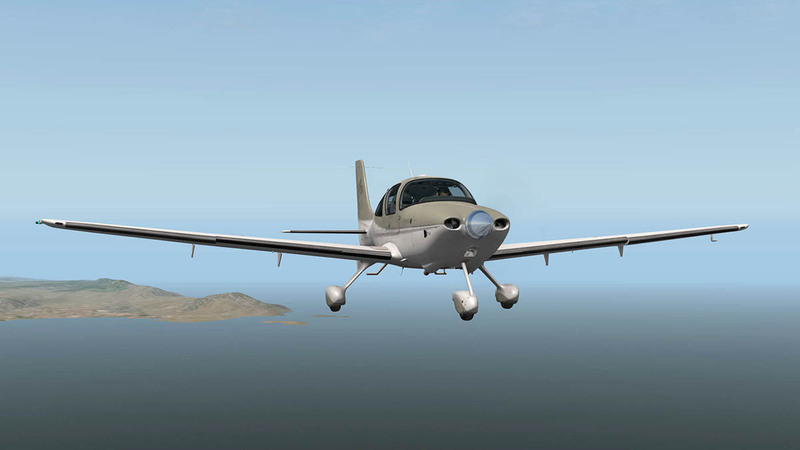 Feel in the air is good and you can easily change the altitude and bank to keep the right momentum and climb with ease. Once leveled out and clean, I selected the A/P on the centre console to take control of the NAV (flightplan) and the rate of climb to the set altitude of 6500ft. 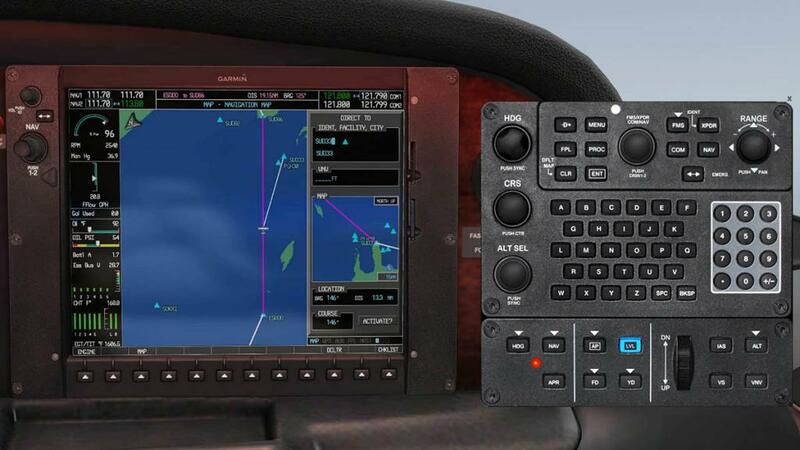 The layout of the autopilot and controls on this console panel are excellent, very easy to use and operate. Rate of Climb is around 1000fpm (official is 1,250fpm) and here the Turbo comes into its own, more importantly is the performance as you go higher. 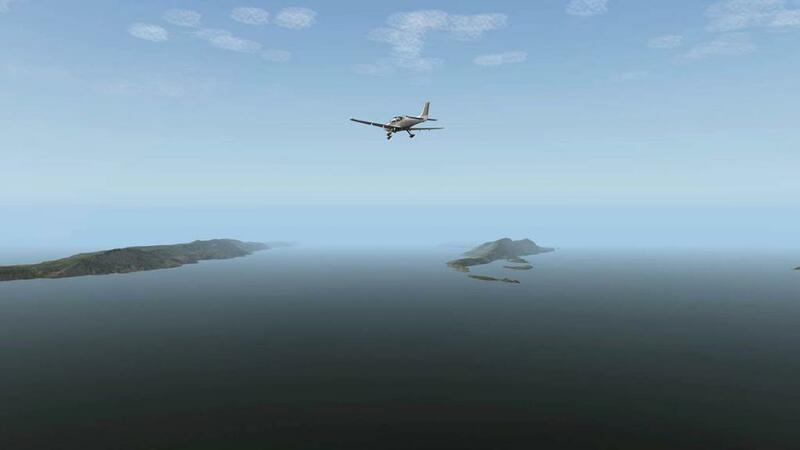 The aircraft's ceiling is 25,000 feet, but it's easy enough to estimate that at an average of close to 1,000 fpm for the entire climb would take between 25 and 30 minutes from sea level to FL 250. You would never really do that height as you would waste too much performance. 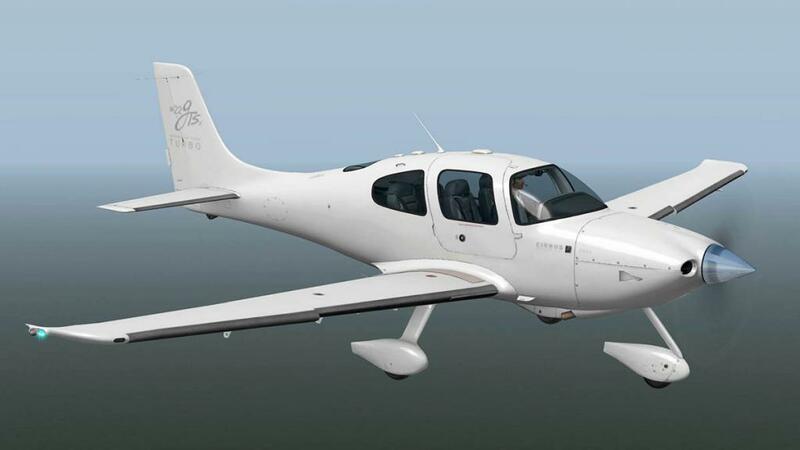 The turbo performance makes a lot more sense down low at the non-oxygen-required altitudes from 9,000 to 12,000, but this is far better performance than the non-turbo normally aspirated Cirrus, or any other non-turbocharged airplane for that matter, because once you get much higher than around 6,000 or 7,000 feet, the lack of air starts to cut down on the airplane's performance, reducing your rate of climb substantially, but not with the turbo as you can keep on giving on with all that extra power, but below 5000ft though the aircraft flies the same with either the normally aspirated Cirrus and turbo versions unless you need that extra push when required. 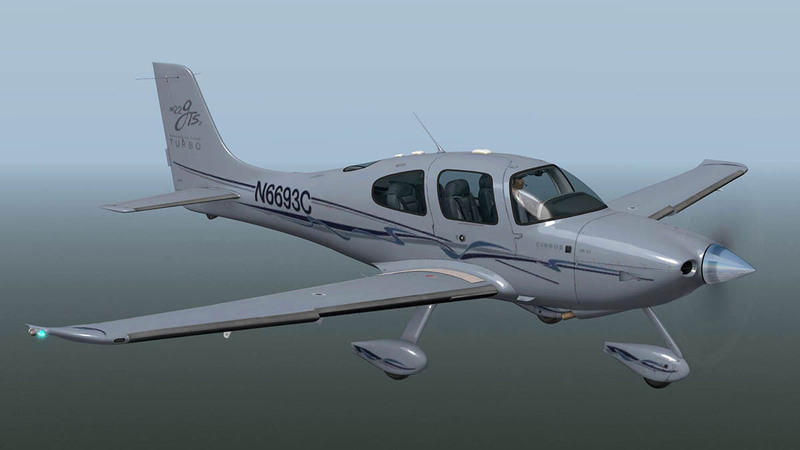 Most sales now are with the turbo versions of the SR22 than the normally aspirated Cirrus. 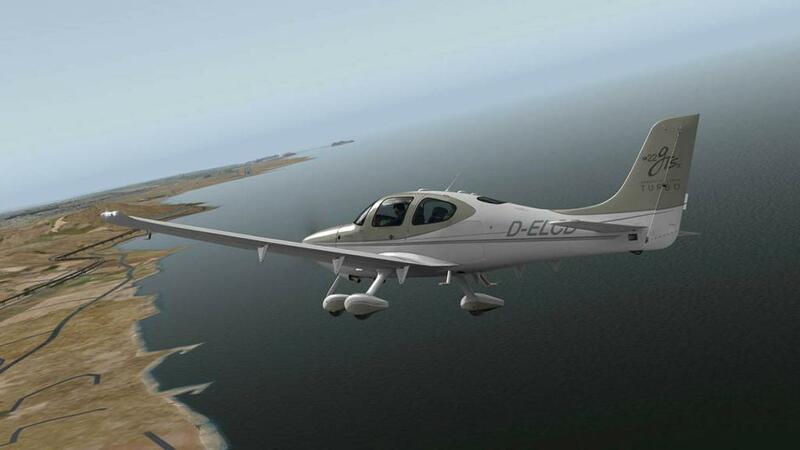 Top speed in the thin air is 215knts but the average at 12,000ft is 194knts in cruise mode. Range is 1,049 nmi (1,207 mi; 1,943 km) with reserves at 65% power. Now as we leveled out at our 6500ft altitude you can see the engine performance on the ENG mode page and the huge amount of data available on the AUX-TRIP PLANNING mode page. Both are impressive in flight. NRST (Nearest) options include AIRPORTS, NDB, VOR and Waypoints and there is a DIRECT-TO function that can be accessed and activated if required. These menu page screen provide so much information you can't cover everything here, but they are excellent in operation and detail. We are cruising now high above the Greek Islands, yes it is nice place to be... best moment in a while actually. 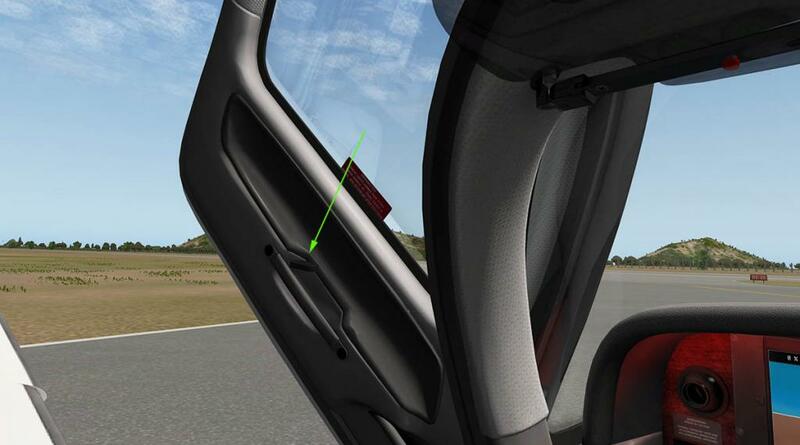 The view forward is quite restricted and the blinds tend to make it even narrower to look through the windscreen than it needs to be. 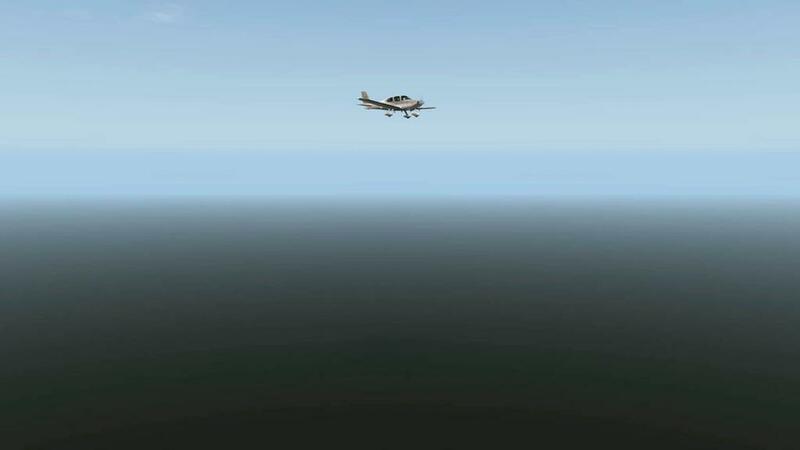 You can easily move them to the side while flying and that gives you a more open fuller screen vision. 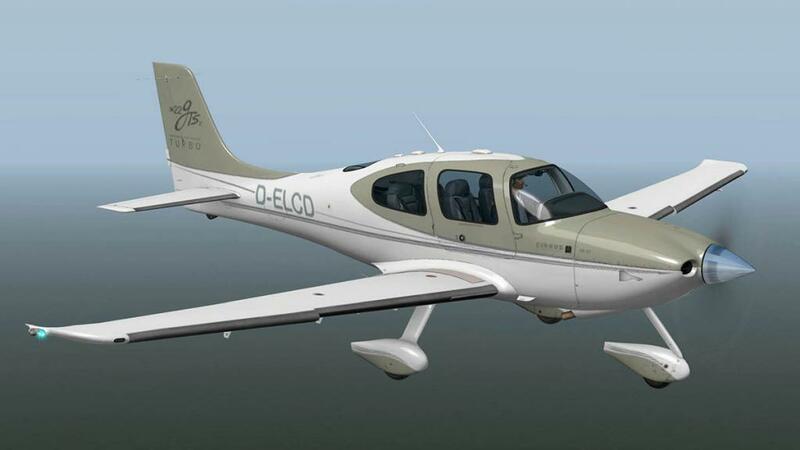 External design of the SR22 is excellent, this is a Carenado after all and you would think of nothing else from them. The tri-gear is a fixture, so don't go looking for an undercarriage lever because there isn't one. But the detailing is superb, first rate and you simply can't fault it. The aircraft's textures are quite shiny, so it can be very washed out in the high Greek sunlight at certain angles, but overall the external aircraft is excellent. Terrain mode on the MAP display is very good. 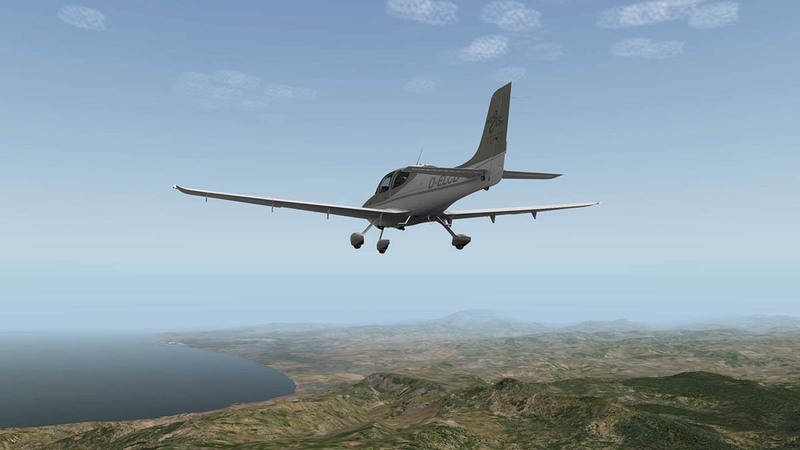 As I skimmed along the Crete northern coast the mountainous ranges were well represented on the display. 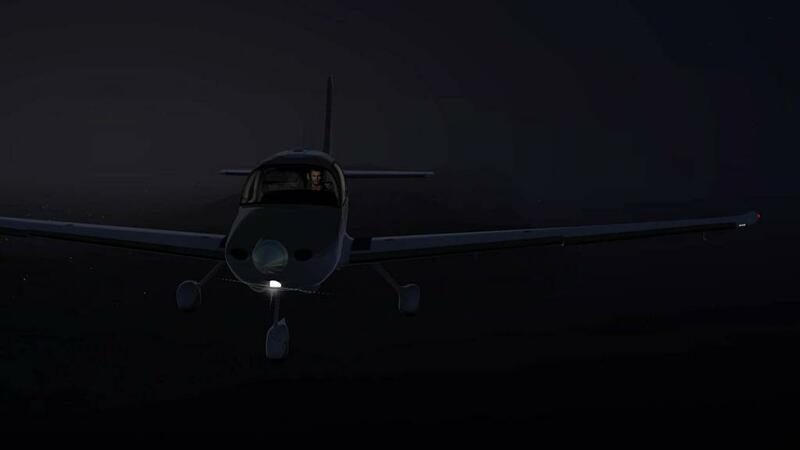 A must for flying at night or with minimum visibility. You have to watch your fuel usage and be ready to switch tanks as you hit the minimum section in the earlier selected tank, you can lean the mixture a little to find the best performance to economy range and experiment to get performance you like the best. 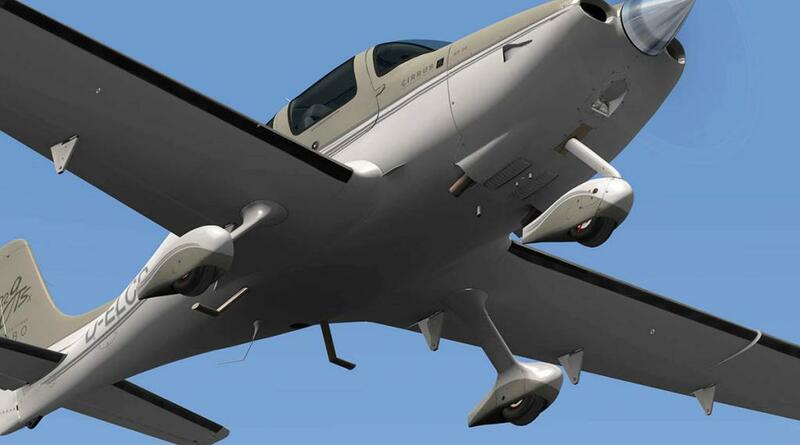 The Cirrus has a built in safety feature of a parachute called the "Cirrus Airframe Parachute System" in case the engine goes wonky or you forget to switch over the fuel tanks. It is set out on the roof and you can pull off the cover and pull the handle. It is however not advisable to use if you are running well on the flightplan. 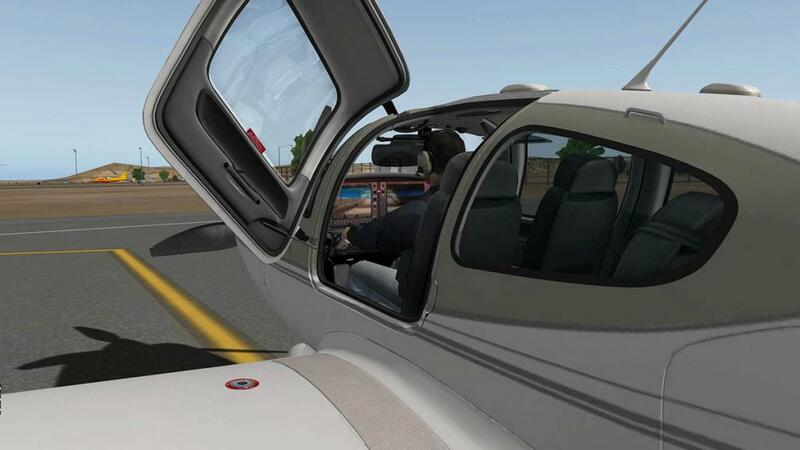 Unlike the VflyteAir SR20 version were as the parachute does actually work... here you are just sent to the closest airport runway in an instant. 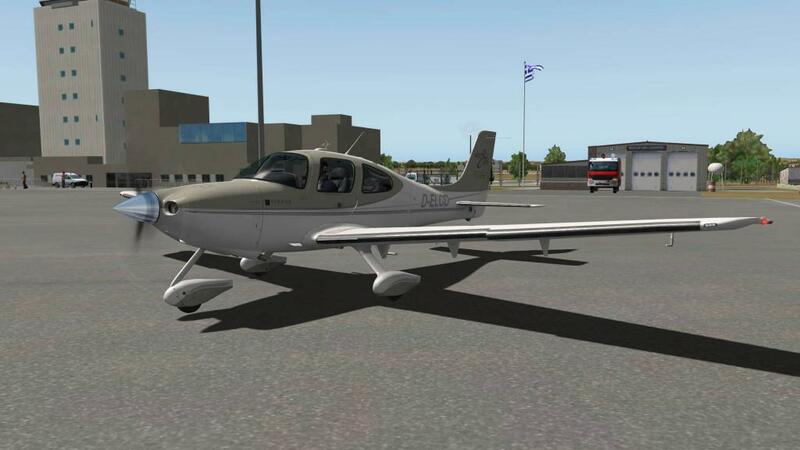 LGIR - Heraklion “Nikos Kazantzakis” is now just over the next range, time to slip down and get ready for landing on RWY27. 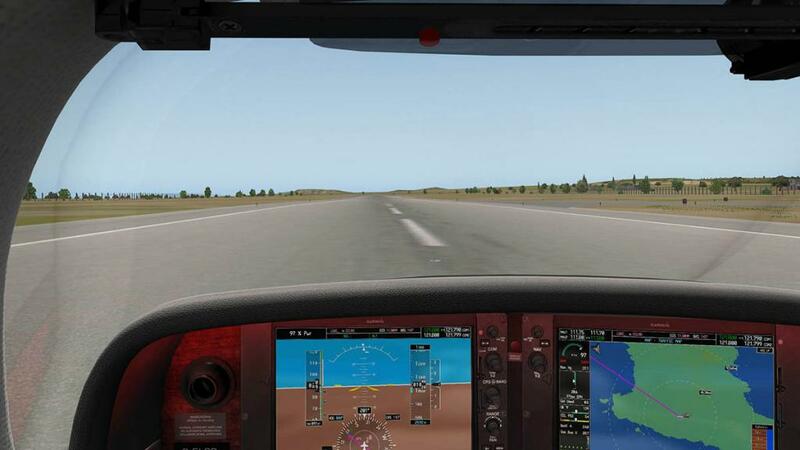 At 1500ft I turn off the flightplan and select a heading to be in a circuit parallel line with the runway and a pass and return to the airport is required for the 27º heading landing. 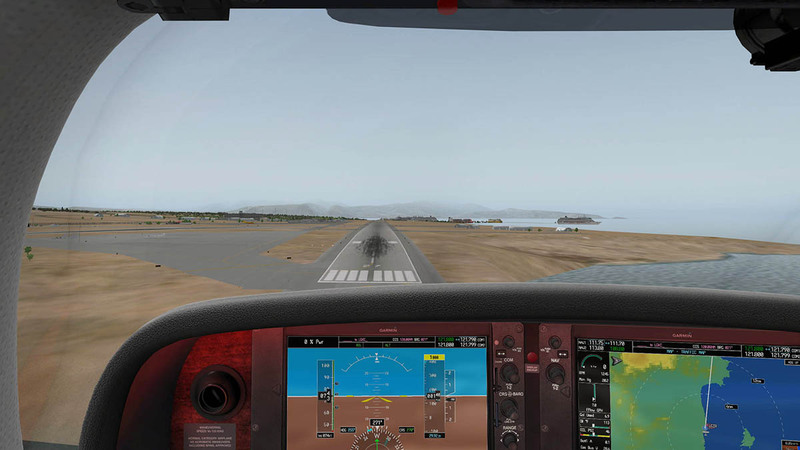 Tight, tight 360º turn is neck straining as I search then find the direct line back to RWY27, speed down and flaps down two positions. Flaps and mechanism are very well constructed, but the inside wing texture is a little dubious. 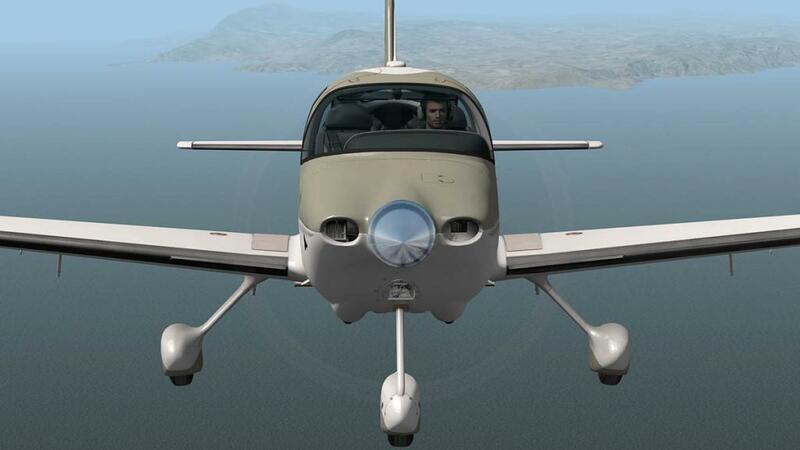 Note the excellent panel work on the wings and fuselage... "Heads up mate we are landing!" 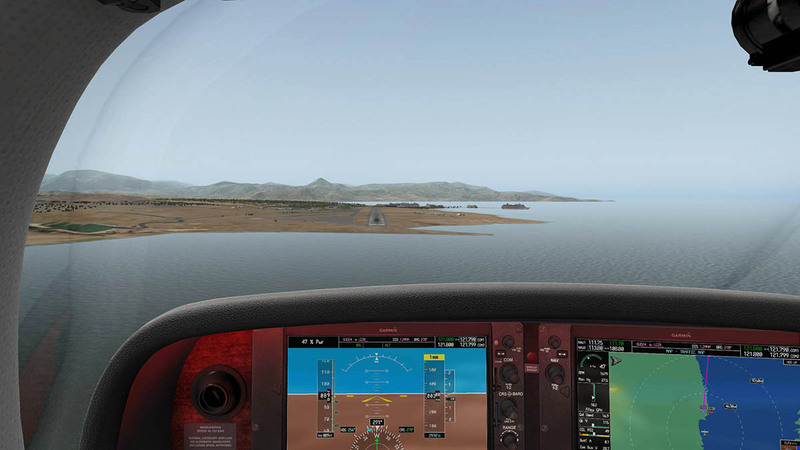 Even with a small slight crosswind the aircraft is very stable, around 70knts in the final approach and a slow clean descent can give you little bounce on contact. You have to rub off a lot of speed before touching the brakes... I mean a lot. 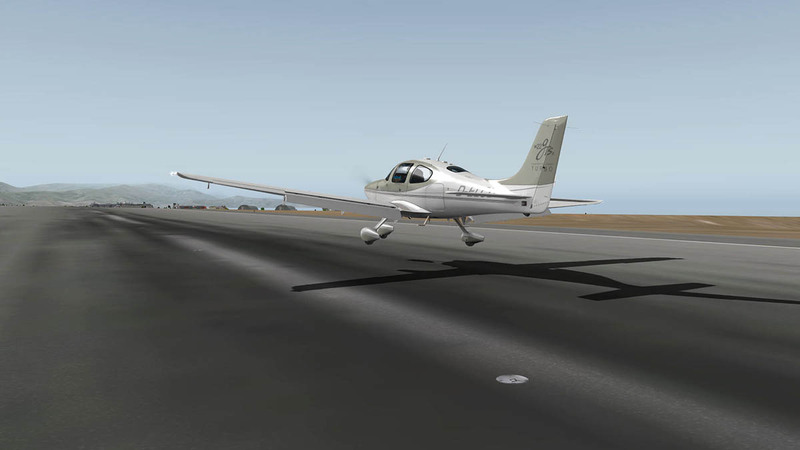 If you are tempted earlier you will simply disappear off the runway to the left and go off straight into the scenery, get it right and you will turn neatly on to the side taxiway. Shutdown and when opening up the door the hot humid Greek air fills the cool cabin, Job done. 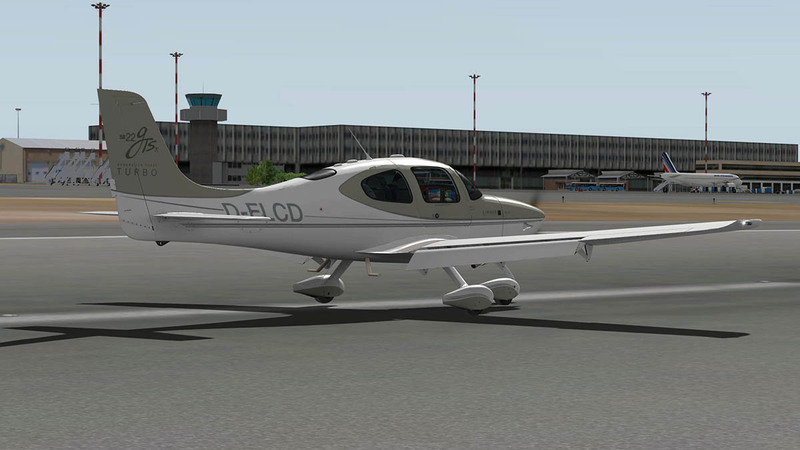 Standard Carenado blank/white livery and five designs are all very high 4K quality. There are three adjustment knobs for Instrumentation and displays, the red cowl lighting and overhead lighting. There are four overhead spot lights that are + manipulator adjustable to shine in any direction in the cabin, two front and two rear. The front spots however are under the front blinds, and so to be used effectively you need to move the blinds out of the way. You can certainly find the right feel in the cabin, but full on red under cowl is a bit stark and distracting. External lighting is basic with just Nav, Landing (single light) and flashing strobes. Nice touch are small sets of LED lights located at the front of each wingtip. 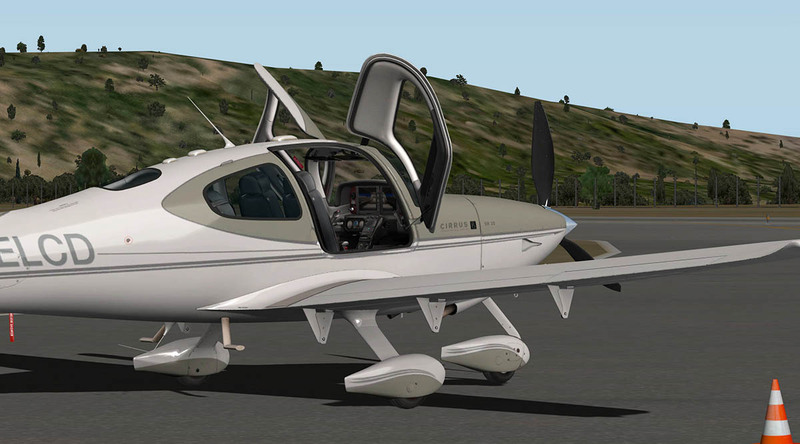 It is a Carenado and with this brand you know that quality, features and flight dynamic depth are usually first rate to excellent. That is certainly delivered here at a quality price. So you get a lot for your investment. The SR22 is a great aircraft to fly and the depth of instrumentation and details are certainly first rate, that is a given as well. 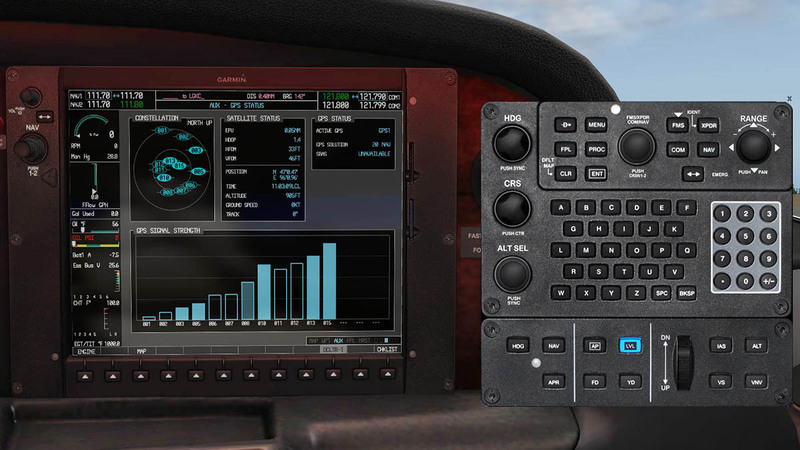 The G1000 Perspective (PFD and MFD) with GFC 700 Control Unit is certainly a huge feature here, but it comes with a big stick. It is a colossal complex sized system that has a huge amount of data to process. It takes time to separately load in all that 3.83gb, yes gigabytes worth of data (It thankfully does not use it all at the same time but just loads a few area tiles). But it does all have a significant impact on your frame-rate and Carenado aircraft are not the lightest aircraft in the hanger in the first round and so your computer processor has to cope with a large chunk more with this GPS G1000 system on top of the aircraft again. My i5 Mac computer just scraped through with its average processing performance, so it is usable. But I would highly recommend a machine with a pretty grunty or powerful sets of processors and memory to give you a fair amount of working headroom and data space. 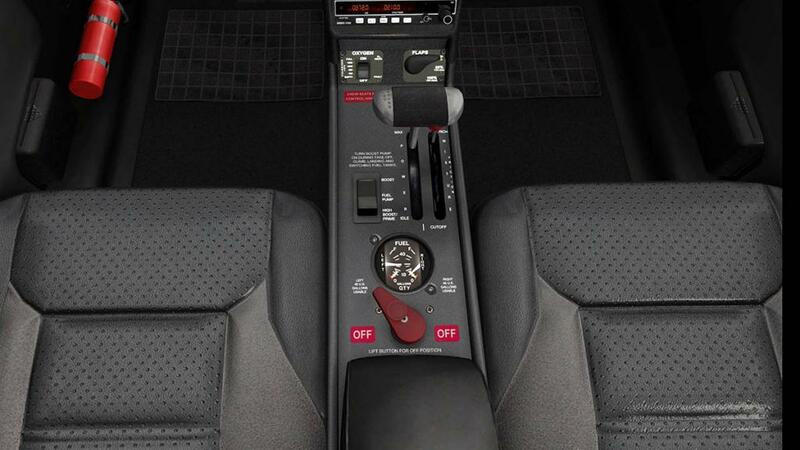 Only other quirk is the twitchy castoring steering which will need mastering at slow speeds. 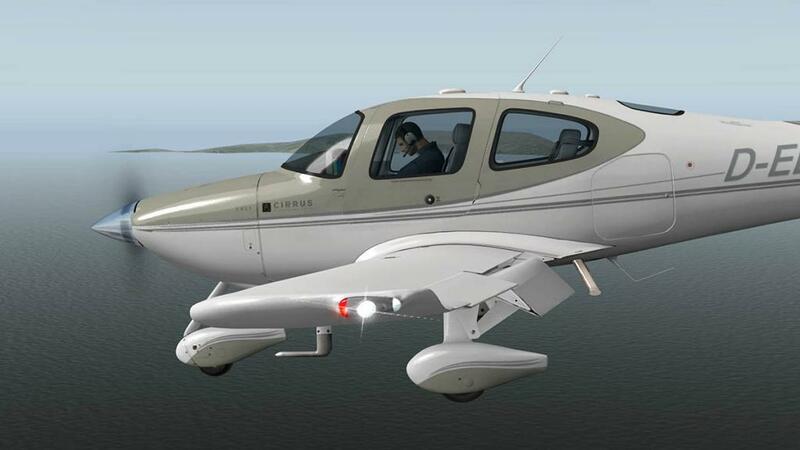 Overall the Cirrus SR22 ticks all the right boxes and gives X-Plane users another great step forward in sound, design, features and even more better quality in a general aviation aircraft. 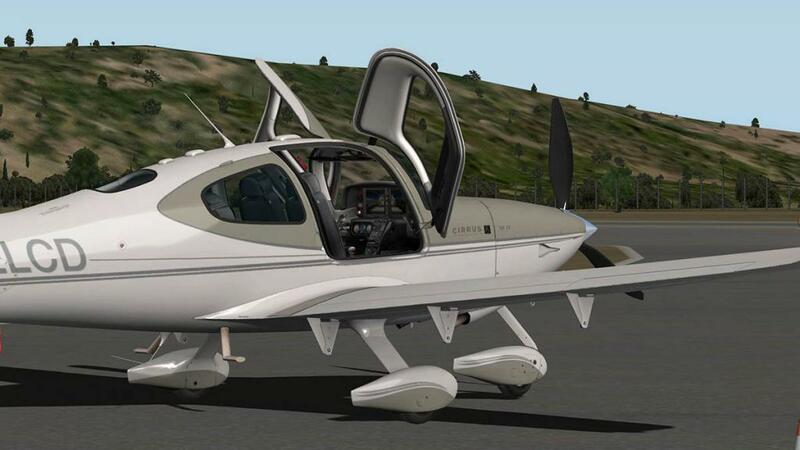 A real nice aircraft to fly as well and with all that Turbo power for great performance. So another great winner from Carenado. 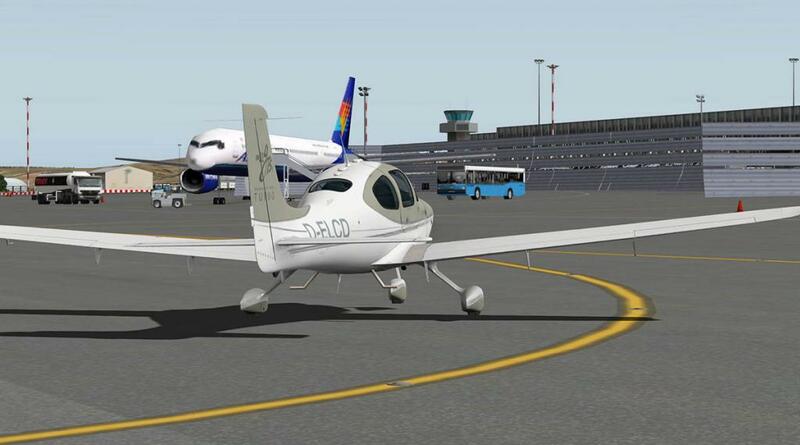 Installation and documents: Download is 209.50meg and the aircraft is deposited in the "General Aviation" X-Plane folder at 256.90 meg. Installation key is required on start up and is supplied with the purchased download file. 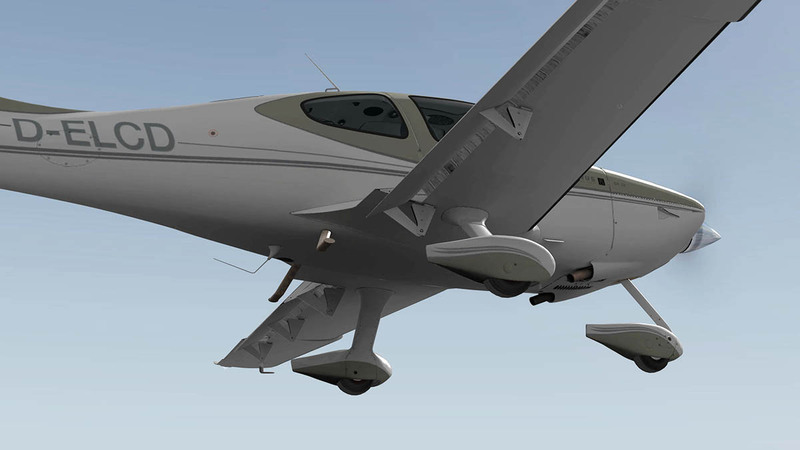 Carenado G1000 data package is also required and has to be installed in the X-Plane root folder (Main X-Plane folder) before using the aircraft. Data download pack is here; GPS database and it is a big download at 870mb. The module is indeed beautiful. At this point, the only problem I have found is that the PROC button does not work to find and load approaches, SID's or STAR's. 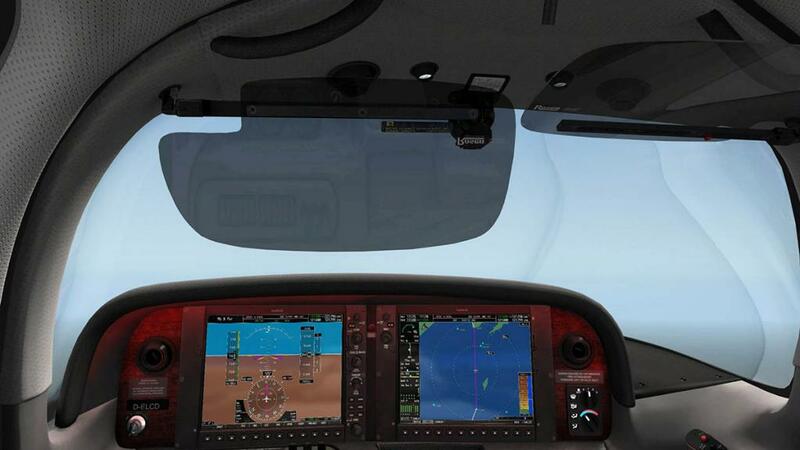 This is pretty key functionality for using the G1000's to practice IFR work. The good folks at Carenado say that they are working on this but to not have an ETA. 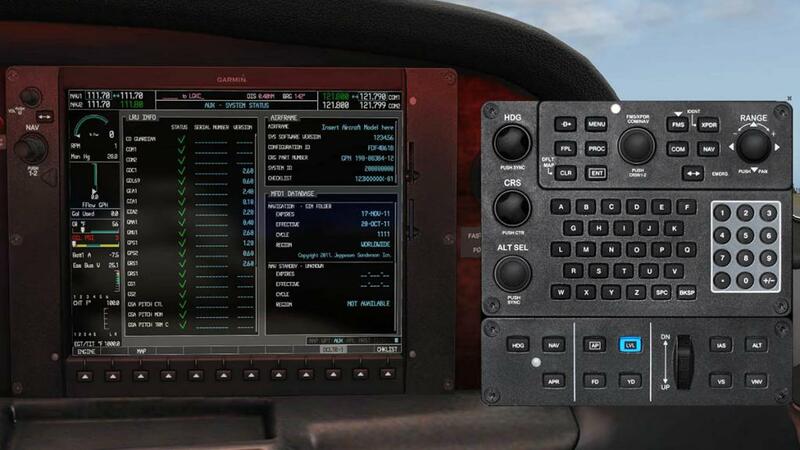 I look forward to this functionality (which they have on the similar module for FSX). 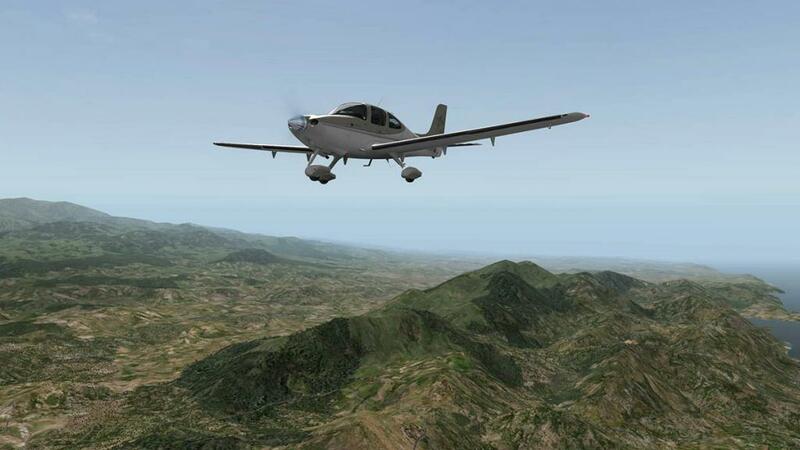 Yes it is!, the latest update (XP11) is now available. 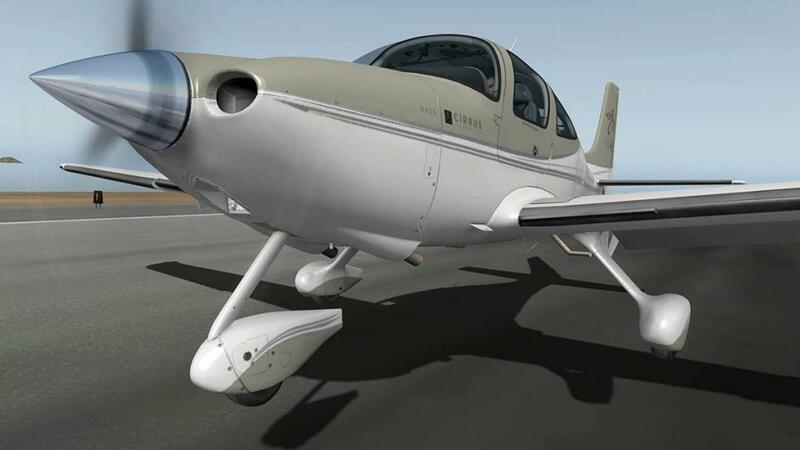 All textures and performance are now XP11 as well as the PBR textures, sounds have been updated but not to FMOD spec yet, but they are coming soon as well. Nice looks and details from the inside and outside, just very pretty graphics overall. 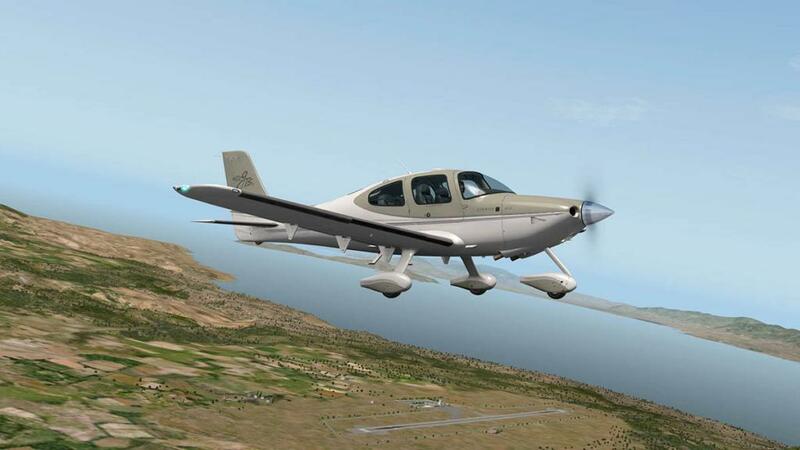 Database: Can't fly IFR properly as no procedures not fixes on the database (or at least I can't find them). 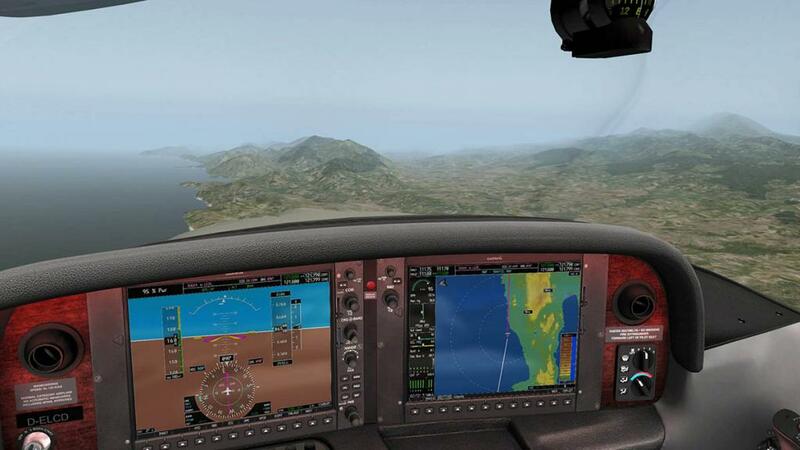 Elevator: If I fly short final at 80kts at way below max gross still dont have enough elevator travel to break the decent rate. On the real plane you can start idling over the numbers at 1.3-1.2 Vso. If you do that here you will land VERY hard. 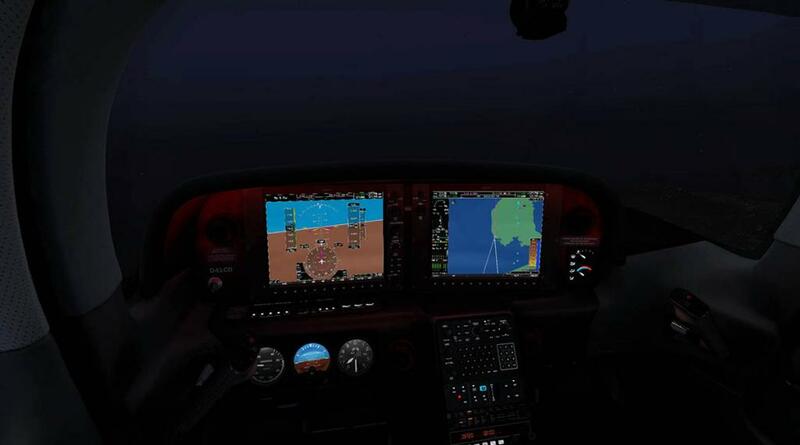 Only way I've found to land soft is to leave power on all the way and come in at 85-90kts (which in real life is too fast). Rudder/yaw: Right turn tendency on certain take offs configurations. Full power climb no p factor (ie no need for rudder input on climb...). Overall not an accurate flight model. Tried playing around with weight and balance and trim config. Throttle: It jitters when set to a particular level, hard to set accurate % (I use thrustamster 4). Overall quite disappointed will continue to try to configure it. 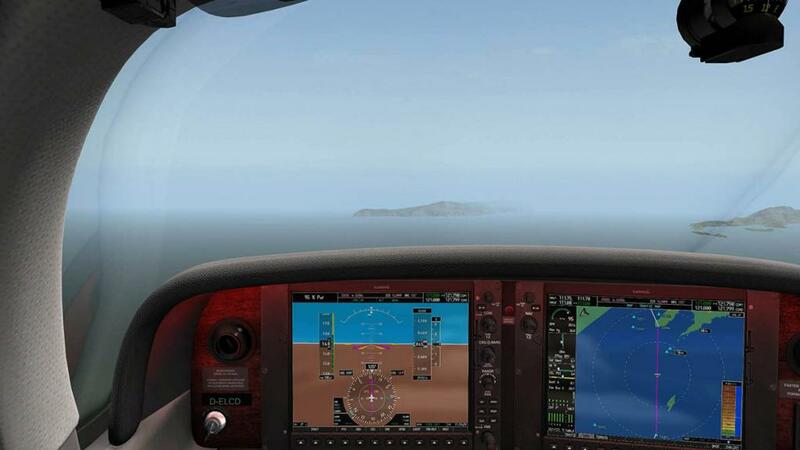 This version is now quite old, so an update to X-Plane11 should be due this year with an update to the native G1000 instead of the bulky Carenado version, but you don't note if you are flying an XP10 aircraft in XP11 as the performance differences are quite substantial. 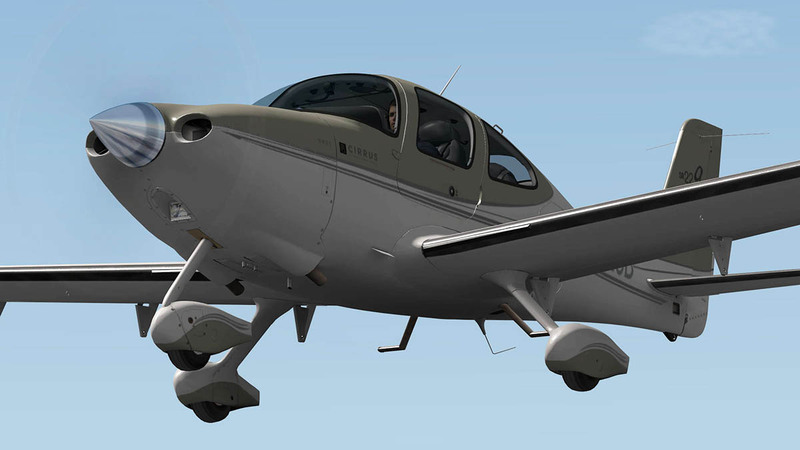 The vFlyteAir SR22 version is already updated to XP11 and is quite nice. 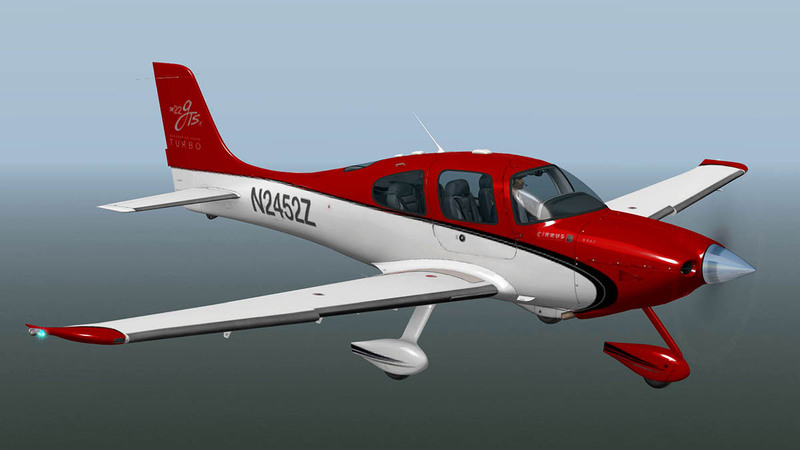 The vflyteAir aircraft is an SR20 though not a 22. BUYER BEWARE: It’s very dishonest and disturbing that Carenado still offers to sell Cirrus SR22﻿ -﻿ GTSX Tur﻿bo G1000 HD Se﻿ries﻿. I bought this back in November 2018 and spent some time trying to get it to work with Xplane11. After finally getting a response from Carenado support (see email from Carenado support below), I found out that it was discontinued. 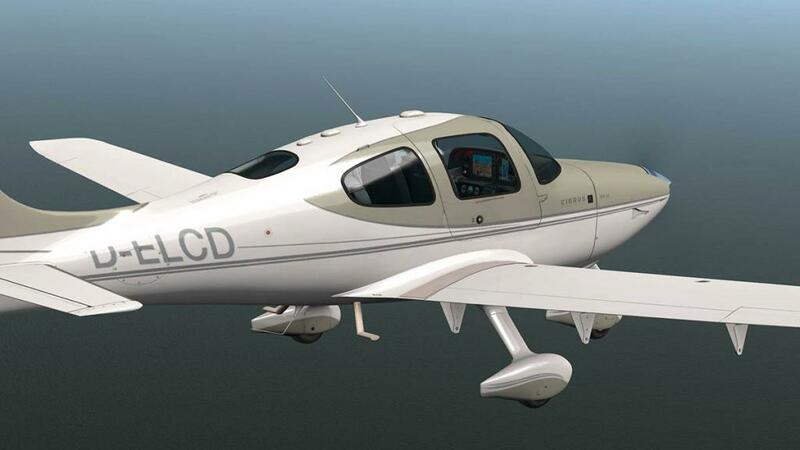 Months after that, I see this product is still being offered for sale in January 2019 with no notice that Cirrus SR22﻿ -﻿ GTSX Tur﻿bo G1000 HD not work on Xplane11. 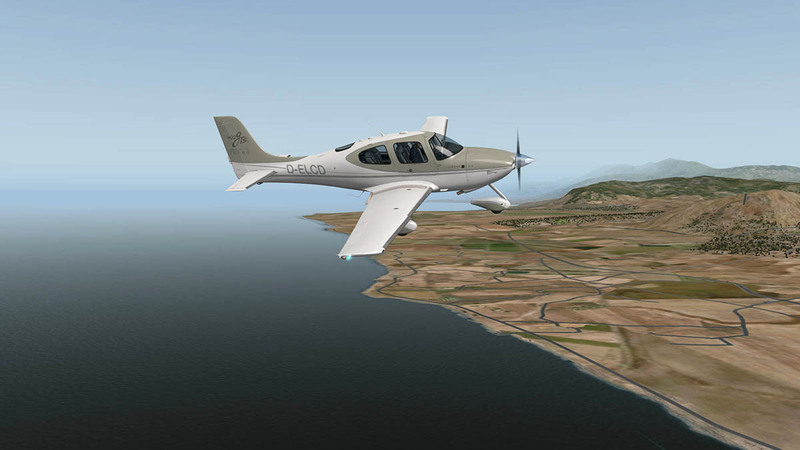 The only XP11 aircraft with G1000 is the Phenom 100, however the Carenado G1000 for XP11 has been discontinued. 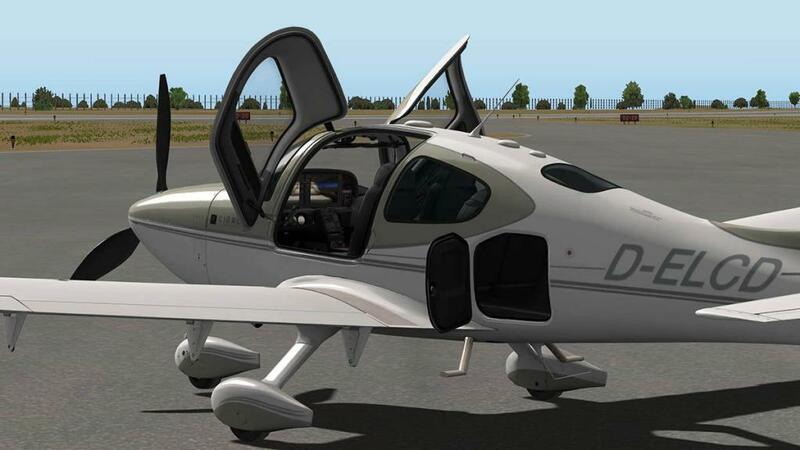 It had less features, was much more difficult to support, didn't have good performance, and has no upgrade path, as it relies on legacy database technologies, whose support is discontinued in XP11. 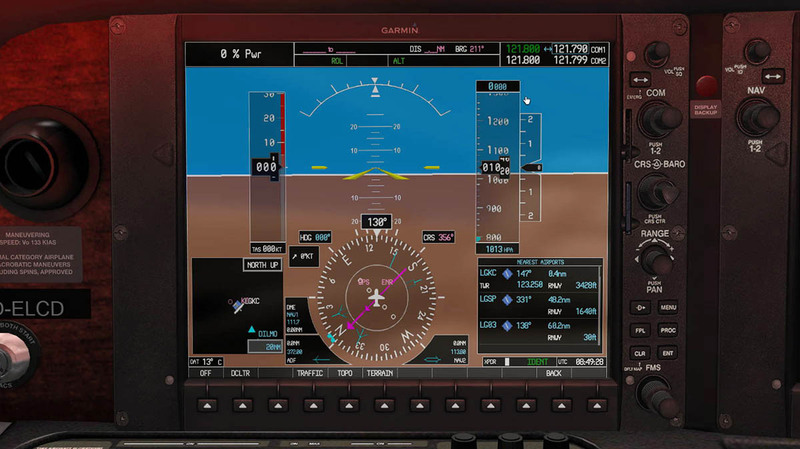 It's a bit of a transition phase right now, where we are still waiting for Laminar to grant us developers the ability to draw content on the 2D pop-up window that currently displays the G1000 unit(s). Once we have that ability, it'll be relatively straightforward for us to add features to the G1000 that the default one doesn't make available to pales of different configurations. My guess here is that you didn't read the requirements? I do not have the g1000 data pack. That me be work trying. Thx for your reply.